Tyanna Buie, Power Pose #3, 2018. Image courtesy of The Alice Wilds Gallery. Free to members or with admission to sculpture garden. Photographs and other material evidence of Tyanna Buie’s disrupted childhood are rare. In these new works, Buie continues to rely on the collective memory of her family to make connections between the past and present. She gathers memorabilia and re-visits and revives previous impressions from familial accounts and recollections to create large-scale monotypes and screen prints. For Im•Positioned, Buie places these personal investigations in a larger context, responding to the work of other artists in residence at Lynden for Call & Response: echoing the family references in Folayemi Wilson’s Eliza’s Peculiar Cabinet of Curiosities and capturing Reggie Wilson’s bodies in motion. Buie was a 2012 Nohl Fellow, and this exhibition has been organized in conjunction with the 15th anniversary of the Nohl Fellowship. This is a Call & Response event. A Chicago and Milwaukee native, Tyanna Buie received her BA from Western Illinois University, and her MFA from the University of Wisconsin-Madison. 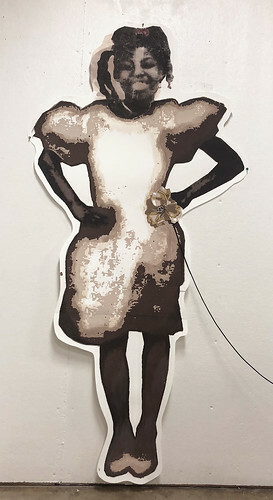 While she has attended residency programs throughout the country, exhibited her work both nationally and internationally, she has maintained her connection to the community by hosting printmaking workshops and demonstrations, and participating in Healthy Neighborhood Initiatives through the production of public art for underserved neighborhoods and communities. In 2012, Buie received the Greater Milwaukee Foundation’s Mary L. Nohl Fellowship as an emerging artist, and in 2015 she received the foundation’s Love of Humanity Award. She is also is a 2015 recipient of the prestigious Joan Mitchell Painters & Sculptors Grant. Her work has been featured in Hyperallergic and has been acquired by major institutions and private collections. Buie is currently living in Detroit, where she is an assistant professor and section chair of Printmaking at the College for Creative Studies. Ibile is a Yoruba word for “the messenger of our ancestors.” Arianne King Comer makes textile works—paintings--using centuries-old resist-dye processes. These works come from her spirit, represent her ancestors' call, and reflect the South Carolina Low Country that she calls home. 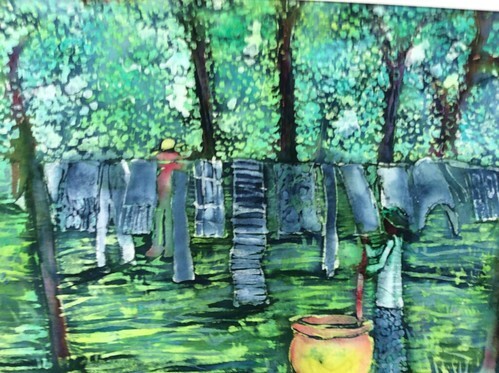 When Comer arrives for her residency in early July, her solo exhibition, Ibile’s Voice, will slowly transform as her paintings are joined by the works of the community members who join her around the dye vat. This is a Call & Response event. Ibile is a Yoruba word for “the messenger of our ancestors.” Arianne King Comer makes textile works—paintings--using centuries-old resist-dye processes. These works come from her spirit and represent her ancestors' call. Many of the landscapes included in this exhibition of fourteen painting depict the South Carolina Low Country that Comer calls home. Among the works, most dating from the past two years, are still lifes, abstracts, and two intimate scenes of Lynden made during her residency last summer. This is a Call & Response event. Free to members or with admission. Katheryn Corbin makes work that responds to the climate: physical, cultural, political. In this exhibition, she shows a series of nearly-life-sized figurative ceramic sculptures, as well as sawdust-fired vessels made during a residency at Lynden. 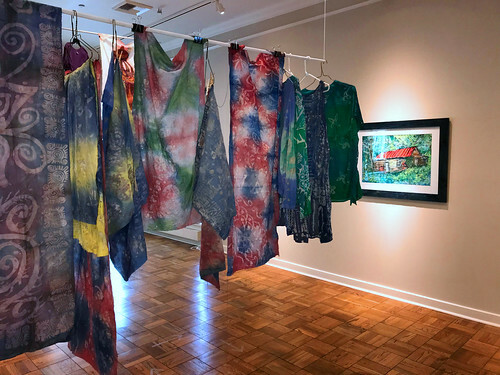 During her residency, which began in June 2016, Katheryn Corbin began to connect the migration of the birds and butterflies she saw at Lynden with news of the worsening international refugee crisis. While much of her time at Lynden was spent making vessels that she fired by burying them in sawdust in a trash can out on Lynden’s grounds (a 24-hour process that provided plenty of time for observing the landscape and its inhabitants), she also used the studio to make ceramic sculptures. 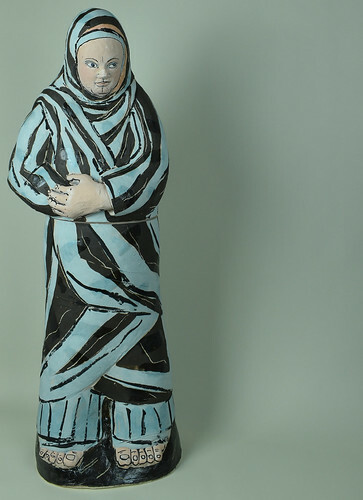 Corbin began making full-length ceramic figures in 2006, and she has returned to the practice sporadically since then. The hollow figures are made in two, and sometimes three, parts, so they can be fired separately in the kiln. After firing, Corbin paints the surfaces. Her earlier figures use dark line to define the pale, almost monochromatic forms. In early 2017 she made two migrant figures at Lynden, one carrying a child on her back, and used their surfaces to explore pattern and color. Nine painted figurative sculptures fill Lynden’s gallery, arranged in tableaux. Corbin views these sculptures as actors in dramas, and she contextualizes them with props: pots, a small watercolor, skirts, a folding window. Drawing on her interest in the movement of butterflies and a photograph of a performance she saw in a newspaper, Corbin created “Chasing Butterflies,” a vignette of two half-figures with tulle skirts and a small, Pierrot-like boy stationed among butterflies and flowers. 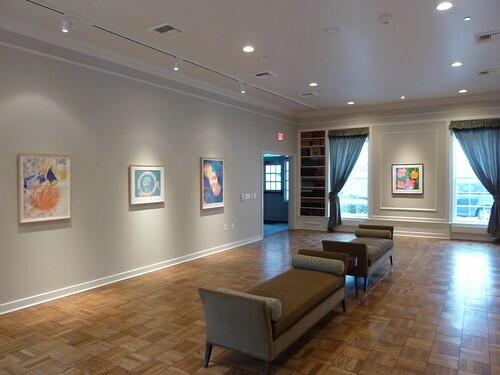 This interest in movement and migration recurs just outside the gallery, where a digital print, an enlargement of a watercolor of a dead bird, hangs; she has also included a large painting of Japanese magnolia blossoms in the front entrance, a nod to the tree not far beyond Lynden’s patio. 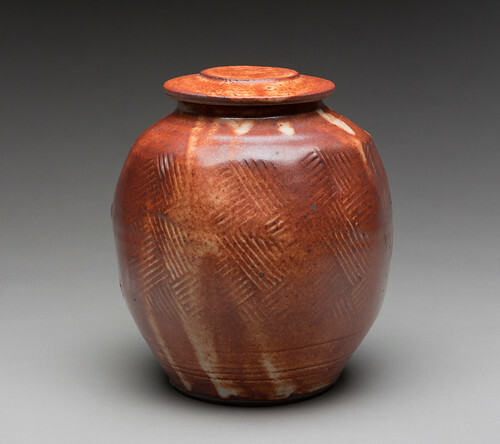 Several of Corbin’s sawdust-fired pots are dotted across the gallery. Two large vessels have found their way into the dining room, where they share space, and an interest in organic forms, with Isamu Noguchi’s Sinai. It is not unusual for the natural world to make its way into work produced during and after a Lynden residency, but as Corbin’s exhibition illustrates, time spent at Lynden by artists-in-residence can impact work in unexpected ways. 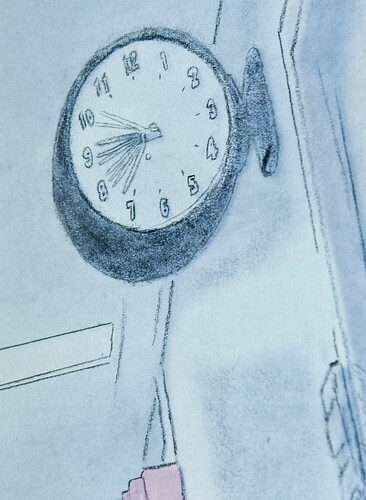 For Corbin, the opportunity to devote time to thinking led to new ways of connecting ideas and approaching an established practice. She began her residency on the functional side of her ceramic practice, with the goal of investigating the chance processes of sawdust firing in conjunction with other forms of surface embellishment, such as painting and drawing. The timeframe—more than a year—created opportunities for her to expand her project, to explore different mediums (she made paintings, drawings, sculpture, and photographs in addition to the pots), to respond in a timely way to the world she was living in—both at Lynden and at large--and to discover new links between her functional and sculptural practices. Katheryn Corbin spent her childhood in Detroit, Michigan, and her adult years in Illinois and Wisconsin. She received her MFA in Ceramics from University of Wisconsin-Milwaukee, and her BA in Art and English from Augustana College in Rock Island, Illinois. Her ceramic work, which includes functional and sculptural approaches to clay, has been exhibited in galleries and markets on the East Coast, in the South, and throughout the midwest. Her figures, both on the wall and life size, are in the collection on the campuses of Epic Systems in Verona, Wisconsin, as well as in numerous private collections. Corbin has taught in both public and private museums, schools, and universities, and teaches ceramics workshops at Lynden. Barbara Hepworth, Corymb, 1959. Image: (c) Bowness, Hepworth Estate. Photo: Reece Ousey. As winter closes in, we will fill the gallery with smaller works by the artists whose sculptures punctuate Lynden’s landscape. Among the works: a recently-acquired set of five Tony Smith posters for The Wandering Rocks, just outside the window; a wall relief by Heinz Mack; and sculptures by Barbara Hepworth, James Rosati, and more. A publication with an interview with Gabriel Ritter, Curator and Head of Contemporary Art at the Minneapolis Institute of Art, and an essay by Scott Cowan, will be published. 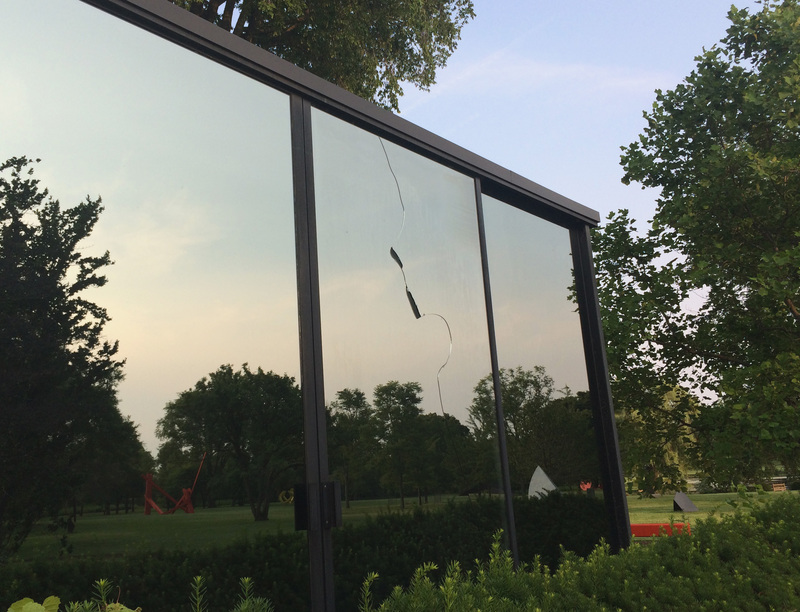 Katy Cowan: reflected-into-themselves-into-reflected includes seven new sculptures that begin in the gallery and spill out onto Lynden's grounds, as well as a series of preparatory drawings. The exuberant forms of Cowan’s painted wooden sculptures--prairie plants and landscapes will come to mind--fill the gallery, and bronzes, slipped into unexpected locations outside, provide a playful and subtle commentary on the not-quite-wild environment at Lynden. In the gallery, the wood sculptures simultaneously reference domesticity and the world beyond the windows. For Cowan, the sculptures of prairie plants allude to the flowers she keeps in vases in her home. She returns to the complicated ontology of still life, creating a charged relationship between the living still life in her vase, the wooden still life on the pedestal, and the abundant life on Lynden’s grounds. The surfaces of these wooden works are variously inscribed with watercolor, enamel, and acrylic paint, lacquer, oil, colored pencil, and graphite--materials that they share with the drawings that trace the evolution of individual pieces. Ultimately, Cowan views the exhibition as an extended reflection, and an ode to “very pensive beautiful moments that are particular to Wisconsin.” The phrase “reflected-into-themselves”--and Cowan’s palindromic title--comes from Hegel via Frederic Jameson. The phrase itself reflects the difficult passage of ideas, often nouns encapsulating a single idea, from German into English. Cowan has adopted it--and Hegel’s sense of reflection as an illuminating, dialectical process--as slightly awkward shorthand for a constellation of ideas that inform this exhibition in which all the sculptures are in dialogue; reflection describes both the properties of materials and the process of viewing; and sensitivity to site, or placement, reflects the artist’s conceptual practice. Katy Cowan (b. 1982 in Lake Geneva, Wisconsin) received her BFA at the University of Puget Sound in Tacoma, Washington and her MFA at Otis College of Art and Design in Los Angeles. Last fall, she was included in the Wisconsin Triennial at the Madison Museum of Contemporary Art, and recently opened her third solo exhibition at Cherry and Martin in Los Angeles. Cowan’s work has been included in the cross-medium exhibition Condensed Matter Community organized by the University of Wisconsin-Madison’s Physical Sciences Laboratories and in as if form were some pitcher at Fourteen 30 Contemporary in Portland, Oregon. 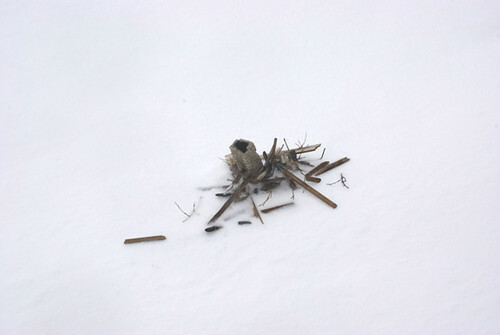 Recent solo and two-person exhibitions include Kate Werble (New York) and The Green Gallery (Milwaukee). Other group exhibitions include Cherry and Martin; the Poor Farm (Manawa, Wisconsin); Torrance Art Museum (Torrance, California), and Los Angeles Nomadic Division. She has lived and worked in Milwaukee since 2014, and is moving to Riverside, California, at the end of the summer. Cowan is represented by Cherry and Martin. Cecelia Condit, Tales of a Future Past (2017), video still. Fear and displacement are central to Cecelia Condit's work, which dissects the entanglements that connect self, society, and the natural world. Condit is a storyteller, particularly of psychologically inflected contemporary fairy tales, whose work--like all the best fairy tales--oscillates between beauty and the grotesque, innocence and cruelty. Her videos document the frailty of personal identity in the face of the primordial unknown that sits just outside the frame, a charged space loaded with irony and danger. Condit's exhibition at Lynden reflects her increasing interest in landscape and the natural world. 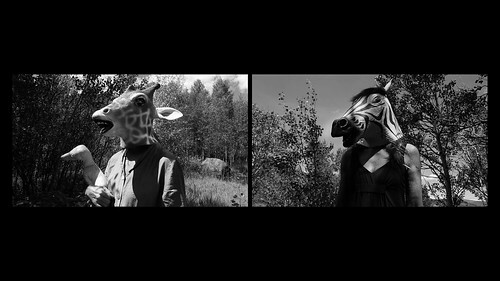 Her most recent two-channel installation, Tales of a Future Past (2017), explores extinction through the story of a lone giraffe who collects small animal forms that evoke treasured memories, hope, innocence, and grief. When an aggressive zebra crosses her path, the giraffe’s fragile world is threatened. In Tales, Condit considers time and space in relation to landscape and our planet, moving from the insistently personal to the universal, and from fairy tale to myth. Also on view will be virtuosic photographs that subvert scale and time to create fictitious landscapes. The Milwaukee Journal Sentinel reviews the exhibition here. Cecelia Condit has shown internationally in festivals, museums and alternative spaces and is represented in collections including the Museum of Modern Art in New York and Centre Georges Pompidou Musee National d'Art Moderne, Paris, France. She has received numerous awards including grants from the Guggenheim Foundation, American Film Institute, National Endowment for the Arts, and the Greater Milwaukee Foundation's Mary L. Nohl Fund Fellowship for Individual Artists. She is currently a professor in the Department of Film, Video, Animation and New Genres at the University of Wisconsin-Milwaukee. Renato Umali (composer, Tales of a Future Past) is a graduate of Northwestern University's School of Music, where he studied piano performance and analog and digital synthesis. In 2003, he earned a master's degree in Film from the University of Wisconsin-Milwaukee's Peck School of the Arts. He currently conducts piano lessons at home and at the Brass Bell Music Store, and teaches film courses, including one studying and constructing film scores, for the UWM Film Department. (L) Pat Hidson, Slide. Photo: Jim Brozek. (R) Tori Tasch, 3 Months of Centerfolds. Pat Hidson and Tori Tasch shared a year-long residency at Lynden that ended in May. It was the first time that Hidson, who is primarily a painter, and Tasch, who makes books and prints, had worked together, but they built their collaboration around their shared concern for the environment and a deep interest in the natural world. For this exhibition, each artist returns to her solo practice, with the occasional nod to the residency in the shape of printed seed packets and cyanotype flags. The garden--a place where Hidson spends a lot of her time--is central to the imagery and geometry of her exuberant two-dimensional works. Her paintings distill experience into intuitive forms; color, movement, pattern and texture--Hidson uses acrylics, oils, glitter, and metallics--convey a sense of living matter. 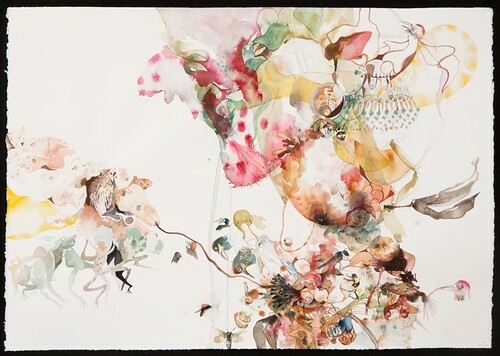 The drawings combine delicate details from nature with abstract forms. Similarly eclectic in their materials, their white backgrounds keep them anchored in a contemplative place. For Tasch, creating books is a daily ritual and ecological investigation. Her passion for repurposing materials and using layered printmaking processes merge in a series of unique handmade books featuring found objects and pamphlet stitched pages. The biodiversity at Lynden inspired Tasch to create a series of diminutive insect books that she paired with found objects from the site. Increasingly, each book is a specimen, a small sculpture made individually, but displayed as part of a collection. For the exhibition, Tasch installs her Centerfold Series of 365 butterflies, one for each day of the Lynden residency. Like centerfold models, butterflies are lithe, beautiful, and graceful; each butterfly is fabricated from old centerfolds and repurposed pages from science textbooks. The butterfly-books are symbols of transformation; when they are shown together, they mark the passage of time. Pat Hidson was born in Edmonton, Alberta. She began her art training with her artist grandmother, Dorothy Ryland. After attending many years of art classes at the Edmonton Art Gallery, she was fortunate to have a marvelous high school art teacher, Mrs. Darevich, who inspired her to attend the University of Alberta. Hidson planned to be a high school art teacher, but after her third child was born here in Milwaukee she began to do pastel portraits to make money to support her art classes at MIAD, as well as trips with the children. Many exhibitions later she has still not gone back to that teaching career, but sharing her skills with generations of adult students in her studio has been a joy. Tori Tasch is a mentoring artist at RedLine Milwaukee (where she has a studio), an art educator working with K4-8th grade, and a printmaker who maintains a vibrant studio practice. She serves on the board of Milwaukee Area Teachers Of Art, and is the Southeast Exhibitions Chair for Wisconsin Visual Artists. Tasch lives in Merton with her two dogs and husband of 30 years. 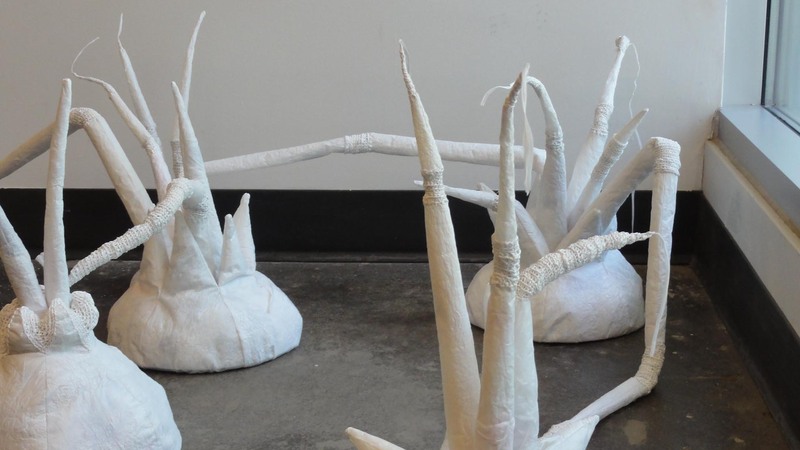 Artist-in-residence Yevgeniya Kaganovich brings her durational project to a close with an exhibition--indoors and out--of all the interconnected, plant-like forms that she, her students, and community members have made from recycled plastic bags over a period of four years. There will be a closing reception on October 1, and visitors are welcome to return on Sunday, October 2, to adopt a plant or two; what remains will be recycled. Yevgeniya Kaganovich, born in Belarus, is a Milwaukee-based artist, whose hybrid practice encompasses jewelry and metalsmithing, sculpture and installation. She received an MFA from the State University of New York at New Paltz and a BFA from the University of Illinois at Urbana-Champaign. Kaganovich has been exhibiting her work nationally and internationally since 1992. Her work has received a number of awards and has been published widely. Kaganovich is an associate professor in and chair of the Department of Art and Design at the University of Wisconsin-Milwaukee, where she heads a thriving undergraduate and graduate jewelry and metalsmithing program. Eliza's Peculiar Cabinet of Curiosities is an ongoing project of the Lynden Sculpture Garden and is open to the public April through October (weather permitting). The Cabinet remains at the center of our education and public programming, with new programming each summer. For our 2018 Call and Response programming, click here. We have published a broadside to accompany Eliza's Cabinet. It is available without charge at the Lynden Sculpture Garden. To view or download a PDF of the broadside, click here. In the summer of 2016, Chicago-based artist Fo Wilson unveiled Eliza’s Peculiar Cabinet of Curiosities on the grounds of the Lynden Sculpture Garden. The full-scale structure is both wunderkammer and slave cabin; it imagines what a 19th-century woman of African descent might have collected, catalogued and stowed in her living quarters. What did she find curious about the objects and culture of her European captors? Southern plantation life? The natural world around her? Informed by historical research, but represented in the past, present and future simultaneously, Eliza--animated by an Afro-Futurist vision that embodies a hopeful version of an African American future--presents an imagined collection of found and original objects, furnishings and artifacts. With Eliza's Cabin, Wilson positions the Black imagination as an essential element in Black survival and self-determination. The fictional Eliza not only assumes the role of collector, anthropologist and naturalist; as curator of her wunderkammer she asserts her right to creative and artistic forms of social commentary about her time. Through Eliza--and the materialization of her interior world--participants have the opportunity to experience history from the point of view of the “other,”as well as through the eyes of an artist who takes history as one of her materials and employs contemporary media and installation strategies to disrupt the viewer's assumptions about the institution of slavery. In this project, architecture and material culture become important agents for the inclusion of voices in American history that are usually marginalized. Eliza's collection includes more than 100 found and original objects and specimens, some that relate directly to the period and others that traverse time. In Eliza's world, the symbolic architecture or enslaved space becomes a vehicle for and expression of freedom, as well as a container for her fanciful interpretation of an alien world and her critical assessment of her perilous situation. From June 2016 to October 2016, Fo Wilson exhibited her ongoing series, P.S. I Love You in the gallery. 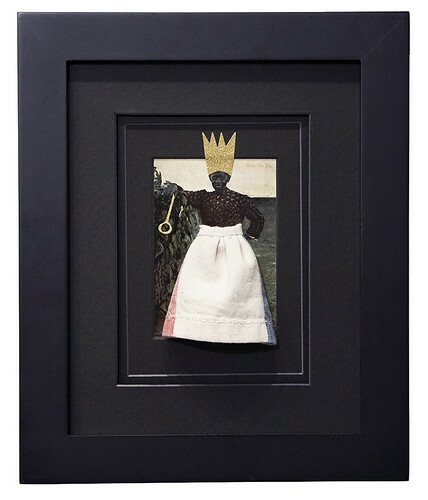 In this series, Wilson takes early 20th-century found postcards that sentimentalize stereotypes of the "happy servant" in the economies of Southern plantation culture and, using collage and mixed media, restores their dignity. The postcards will be shown in an interactive sound environment, a collaboration with Joel Mercedes, constructed from the recorded narratives of former enslaved people archived in the Library of Congress's "Voices from the Days of Slavery." Eliza's Peculiar Cabinet of Curiosities is a collaboration with the Chipstone Foundation and is made possible through the generous support of the Greater Milwaukee Foundation, the Graham Foundation for Advanced Studies in the Fine Arts, the Elizabeth Firestone Graham Foundation, Columbia College Chicago, and the Wisconsin Arts Board with funds from the State of Wisconsin and the National Endowment for the Arts. Fo Wilson uses constructed space and furniture forms to create experiences that reposition historical objects and/or aesthetics in a contemporary context and offers audiences new ways of thinking about and interacting with history. Wilson earned an MFA from the Rhode Island School of Design and is an associate professor at Columbia College Chicago. A grant recipient of Creative Time, National Endowment for the Arts, and the Propeller Fund, her design work is included in the collection of The Cooper Hewitt National Museum of Design. Wilson has been awarded residencies or fellowships at ACRE, Haystack Mountain Center for Craft, Purchase College, and the Anderson Ranch Arts Center. She leads a team that has been awarded a public art commission for the Burnham Wildlife Corridor, a project of the Chicago Parks District and The Field Museum, and is a 2015 3Arts Award awardee. Artist Talk: Friday, May 27, 2016 at 1:30 pm. This event is free. Trained as a metalsmith, Kim Cridler creates works that utilize the history, making, and meaning of objects of utility and ornamentation. Cridler uses drawing as a practice of "noticing," and this directly informs her recent work, in which the steel wire or rod becomes a line of inquiry into form, content, and the potential of narrative. 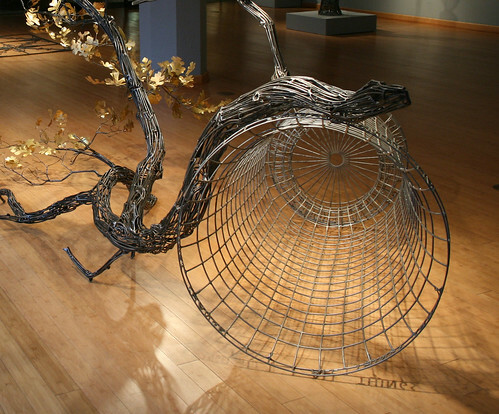 The works on display at Lynden include "Field Study 15: Bur Oak" (2011), a large-scale sculpture of a branch draped across an architectural steel vessel that occupies much of the gallery floor. At the end farthest from the vessel, the branch continues to shed its paper-thin bronze leaves. "Field Study 16: Felled Mulberry" (2012), stands outside the entrance to the gallery, and again examines the relationship between the natural and the man-made. These and the other urns and bowls in the exhibition--formed from intersecting lines of steel--signal function but, with their wide open spaces, steadfastly avoid it. Hidden among the smaller objects and vessels are butterflies, bees, snakes, berries and flowers fabricated in a variety of materials that call attention to their narrative and ornamental functions. Cridler's exhibition at Lynden has been arranged in conjunction with the ZOOM symposium, May 25-May 29. Over the course of four days, 250 makers, writers and innovators will gather at the University of Wisconsin-Milwaukee and venues around the city for lectures, hands-on workshops, exhibitions, and panel discussions. Kim Cridler will deliver the symposium's keynote address, "The Descriptive Line," on Wednesday, May 25, 7:30-8:30 pm at the Peck School of the Arts Kenilworth Square East building, 1915 East Kenilworth Place, 6th floor. This lecture is free and open to the public. Architect Sim Van der Ryn wrote of ten patterns that make up our physical world at all scales including lattices, meanders, and the fractal. How does craft, rarely original yet always in motion, inform how and why we make? This talk will reflect on the conceptual and formal interests Cridler has drawn from the decorative arts, vernacular art forms, and ideas about craft. She will touch on issues of repetition, ideas about beauty and originality, and the essential struggle towards change in the development of her studio and public art works. More information here: http://www.zoommilwaukee.com/lectures/. In the back of the house we are exhibiting watercolors by Dudley Crafts Watson (1885-1972), the first director of the Milwaukee Art Institute (1913-1924), the forerunner of the Milwaukee Art Museum. Watson, a painter, art critic and lecturer, was born in Lake Geneva and moved to Chicago as a small child. When he returned to Wisconsin to assume the directorship, he was already a well-known art lecturer who had completed several national tours. In 1924, back in Chicago, he became the guardian of the young Orson Welles following the death of the future filmmaker's mother, one of Watson's cousins. Watson joined the faculty of the School of the Art Institute of Chicago after completing two years of study there. He returned to the faculty after his time in Milwaukee, and was known for his marine and floral landscapes. The Milwaukee Sentinel of November 9, 1913, identified Watson as the "creator of the music picture symphony," and all four of the abstract watercolors on view, dating from 1963, have musical themes. Read Kat Minerath on the exhibition in the Wisconsin Gazette. Scott Wolniak: Landscape Record includes a selection of recent work from related, ongoing projects: graphite drawings on paper, carved and painted plaster tablets, and small sculptures. Among the drawings is a large commissioned work, Tree - Lynden Sculpture Garden. Scott Wolniak deploys rigorous, transformative processes to complicate relationships between found and made, slow and fast, appearing and disappearing, surface and interior. His latest carved plaster tablets and graphite drawings arrive at similar aesthetic states but from opposite directions: the painted tablets respond to surface texture and chance operations, excavating compositions through deconstructive sgraffito techniques, while the drawings depart from landscape imagery and are built up into complex, almost-recognizable images created through a process of repetitive mark-making, erasure, and re-drawing. For Wolniak, there is a meditative effect in repetitive action, and the accumulation of intricate, layered marks yield phenomenological fields: "Millions of small gestures add up to create spatial energy that is not necessarily about my hand." Curator Nicholas Frank describes Scott Wolniak as an observer of the sculptural qualities of everyday urban decay: "the crumbling and breaking apart of foundations and underlayments, the grid loosening into gravel, rust and dust." This observation (and concomitant collecting) has informed an expansive practice that includes drawing, sculpture, video and painting, and is most apparent at Lynden in the sculptures and series of plaster tablets or sculptural paintings. Frank identifies Willem de Kooning's Excavation, 1950 (which hangs at the Art Institute of Chicago in Wolniak's hometown) as an antecedent, "marking a passage between figure and ground, image and abstraction, form and formlessness. It is a painting that teaches a painter how to paint by baring its process. De Kooning digs into his plastic surface and pulls out shapes that coalesce into images and figures even as they dissipate and dig back into their ground." The process of Wolniak’s recent paintings is harder to trace by eye, given the visual complexity of their layered surfaces, but the evidence is there. Chicken wire and plywood peek through deeply dug strata of plaster. Color informs and evades the actions of painting and removal in the final surfaces, which bedazzle and evoke patterns of abstraction from many histories. Like cities, the tablets tend to bury their histories under gleaming new construction. "Wolniak is not engaged in creating urban allegories, nor natural landscapes," continues Frank, "but his abstraction reveals a richness in paying such close attention to what might have seemed insignificant detail, or chance finds. In much of his work, including the growing set of recent drawings that render natural forms as buffeted scrapes of patterned graphite, he chances at everyday transcendence, a kind of psychedelic regard of the commonplace." Scott Wolniak is a multi-disciplinary studio artist based in Chicago. He received his BFA from the School of the Art Institute of Chicago and his MFA from the University of Illinois at Chicago, and currently teaches at the University of Chicago. Wolniak has exhibited at the Museum of Contemporary Art, Chicago; the Art Institute of Chicago, Chicago Cultural Center; Hyde Park Art Center, Valerie Carberry Gallery, Spencer Brownstone Gallery, Peres Projects, Andrew Rafacz Gallery, 65Grand, and Judith Racht Gallery, among others. His work has been reviewed in ArtForum, Art in America and Art News, and featured in New American Paintings. Copies of the Dan Torop: Frozen Period catalogue are available for purchase online for $25 plus $5 shipping. Please use the "Buy Now" button below to make an order. In a series of extended residencies at the Lynden Sculpture Garden beginning in the summer of 2013, Dan Torop made photographs on the grounds which integrate an historical text--Meriwether Lewis’s June 14, 1805 diary entry describing a day and night in the environs of the Great Falls of the Missouri River--with present day visual explorations. Mindful of ecologist Aldo Leopold's description of a nearby landscape, Torop responded to the passage of seasons, animals, and objects across the site, sometimes intervening, always observing. Frozen Period refers to both a season and an historical epoch. Torop created many photographs during the winter of 2014, when the frigid grounds became an unfamiliar and difficult terrain. The harsh weather, the darkness, and the strict geographic limits of the project became important constraints in which it flourished. But all of the work Torop created was informed by a sense of the "frozen period," the time between the death of the sculpture garden's owner and creator, Peg Bradley, in 1978, and its opening to the public in 2010. During his months at Lynden, Torop sought out the interstitial, private times--early mornings, late evenings, nights--as ideal times to make work. Frozen Period is both a subjective description based upon a year’s photographic work, and an examination of the very act of exploration and observation. Exemplars for this project include Chris Marker’s diary/documentary Sans Soleil and the poetic Americanist writings of William Carlos Williams, Paul Metcalf, and Charles Olson. Through rendering and modifying Lynden's spaces, Torop examines the tension between exploration and domestication, expansion and settlement, the “sublimely grand” and the “pleasingly beautifull” (Lewis, June 14, 1805). The exhibition will be accompanied by a publication that will set Torop’s images to Meriwether Lewis’s 2600-word text, and will include an essay by Nicholas Frank that continues the dialogue with Lynden's landscape and history. The exhibition and publication will coincide with the 210th anniversary of Meriwether Lewis’s narrative. More about Dan Torop's residency here. Dan Torop’s projects deal with the subjective relationship of the land and its inhabitants. He has exhibited digital and photographic work nationally since the mid-1990s, including the solo gallery shows Alkali Desert (2013), Skydiving (2010), Snowbound (2007), Estimated Landscapes (2005), Lost Domain (2002), and Landscapes (2001). Some of his Alkali Desert images are installed at the Center for Land Use Interpretation’s Wendover Exhibit Hall 3. His publication Skydiving (2010, A-Jump Books), a sequence of landscapes and portraits, was included in the International Center for Photography 2013 Triennial’s photo books installation. His digital Ocean has been installed at the American Museum of the Moving Image and the San Francisco Exploratorium. Torop’s work has been supported by residencies with the Center for Land Use Interpretation, the MacDowell Colony, Eyebeam, and Teachers College. He has contributed articles to Triple Canopy, Paper Monument, Modern Painters, and North Drive Press; and has curated or co-curated several shows, including A Rabbit As King of the Ghosts (2006), I Just Can’t Pretend (2004), and Reading Room (2002). Torop is an assistant professor in Florida State University’s Department of Art. He has taught at New York University, City College, and Parsons the New School For Design. He has been a visiting lecturer at Columbia University’s Visual Arts MFA, a mentor for the Art Institute of Boston, and a visiting photography critic at the Yale School of Architecture. Torop received a BA and a Gardner Travelling Fellowship from Harvard College in 1994. In 1997 he received an MFA in Photography from the Yale School of Art. Robin Jebavy makes still life paintings of glassware. Her project, however, is much larger: to offer the viewer an experience that evokes the original, sublime, oceanic feelings of union with the strange and mysterious “other," of self with universe. Her paintings invite the viewer to part the curtain and sense oneness with the world--a state in which we found ourselves in the mother’s womb before birth, and from which we all emerged. Glass is essential to Jebavy's attempt to represent the unique, elusive reality perceived by a person who has experienced a preternatural suspension of the ordinary distinction between a subjective self and the objective world. For Jebavy, the substance of glass lends itself well to the painting process she uses to represent this self-world fusion. Working with layer upon layer of glassware imagery, she generates an atmospheric field of luminous, chromatically intense, intricately woven crystalline labyrinths that invite the viewer to fall into the still life, to get a sense of what she, the artist, experienced. Heightened ambiguity of perspective inspires animation. Mandala-like forms at times double as eyes or serve as active symbols of a unified self-world view; field transforms into figure, suggesting the presence of a breathing life force. Long fascinated by historical and contemporary still life paintings and their narrative, formal, and conceptual repercussions, Jebavy has a particular interest in Dutch Golden Age paintings. In them she finds the great paradox of Baroque art: that emotional extravagance, decadence, and alluring sensual appeal can be governed by rigid compositional control and technical virtuosity without losing their intensity and power. "And yet however fascinating this paradox," she observes, "I notice that the handling of space and perspective in these paintings almost invariably suggests distance between the artist and the still life forms." Her goal has been to offer a new space that shifts reality from a third-person to a first-person viewing perspective; to remove the space between the artist and the still life while at the same time retaining and recalling the intellectual clarity, beauty, explosive dynamism, celebratory tone, and heightened attention to detail and ornamentation reminiscent of the Baroque aesthetic that she loves. 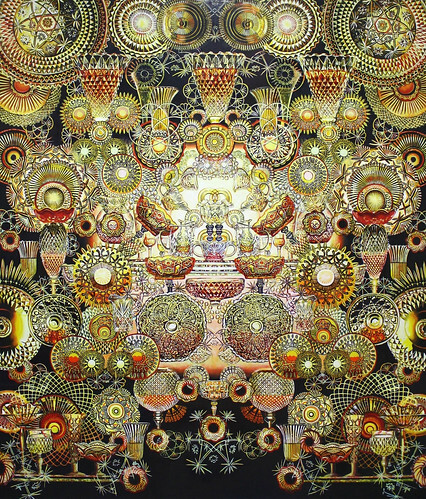 In her compositions Jebavy often includes glassware forms that call to mind other Baroque artworks, such as Bernini’s expansive Baldachin in St. Peter’s Cathedral, or illusionistic Italian ceiling paintings and cathedrals, building altar-like architectural spaces that are at once intimate, domestic, and banal, and monumental, metaphysical, and transcendental. In recent paintings, she has experimented with the use of ornate cut-glass forms to achieve a feeling of the “embroidered” interconnectedness of self and world. For coverage of the exhibition by Arts Without Borders, click here. Urban Milwaukee Dial reviews the exhibition here. The Wisconsin Gazette covers the exhibition here. For an interview with Robin Jebavy by Kat Murrell on Art-A-Go-Go on Riverwest Radio, click here. The landscape at Lynden is dotted with more than 600 trees. There were, at one time, many more: the majority of the elms on the grounds were lost to Dutch elm disease. Now, with the emerald ash borer making its way into southeastern Wisconsin, we think a lot about how to turn our ash trees into a sustainable resource. These trees have shown up in everything from the temporary art installations on the grounds to the lintels in our parking lot. Urban Wood Encounter, now in its fourth year, is designed to introduce the public to the environmental value of urban wood within the context of an exhibition of fine furniture. Urban wood comes from the trees that line our streets, shade our homes, and define our parks--trees that are not harvested for their timber value but instead often find their way into landfills when they succumb to age, injury or disease. According to the US Forest Service, the wood "waste" generated in this country's urban areas, if processed, could produce approximately 3.8 billion board feet of lumber annually. In an effort to advance the sustainable recovery and the best use of the products of urban forests, Urban Wood Encounter challenges furniture makers and designers to create inspiring, thoughtful, and beautiful furniture from this regionally abundant and underutilized natural resource. Participants in the exhibition include Dan Barsch, Andrew Black, Lisa Ehrmantraut Brobst, Greta de Parry & Mike Jarvi, Michael Doerr, Fabian Fischer, Aris Georgiades, Kevin Giese, Joseph La Macchia, Aaron Malinowski, Joseph Murphy, Charles Radtke, Dwayne Sperber, and Andrew Yencha. Recent MIAD alumnus Miguel Ramirez is organizing a functional project room in the enclosed porch. He is working with fellow alumnus Erich Moderow and current MIAD student Linh Hoang. Urban Wood Encounter is organized by Dwayne Sperber and Polly Morris. The exhibition will be accompanied by "tree to table" educational programs that follow the life cycle of an urban tree and that explore possibilities for the use of urban wood. Urban Wood Encounter is supported, in part, by a 2014 Urban Forestry Grant from the State of Wisconsin Department of Natural Resources Forestry Program. Read more about Dwayne Sperber's urban wood project via the Milwaukee Journal Sentinel here. Read Urban Milwaukee's review of the exhibition here. For WUWM's segment on Urban Wood featuring Dwayne Sperber, click here. Rafael Salas reviews the exhibition at Art City here. Kat Murrel reviews the exhibition in the Wisconsin Gazette and the Shepherd Express. The opening of Inside/Outside: Nancy Popp + Paul Druecke on July 26 will be preceded by Conversations with Sculptures: Modern + Contemporary (3:30-5 pm), an expansive, interactive, ambulatory conversation hosted by dancer/choreographers Elizabeth Johnson and Cate Deicher and artists Nicholas Frank and Jenna Knapp. The Conversations series, which has shaped programming at Lynden in July as we prepare for a performance of Trisha Brown's "Early Works" on July 27, has been considering Brown's earliest dances in the context of Lynden's monumental sculptures--both products of the '60s and '70s. This final segment will bring the conversation up to the present by looking at the approaches Druecke and Popp take to sculpture and performance. Popp will be performing the latest iteration of Untitled (Street Performances) during the event. The Inside/Outside series explores Lynden's evolution from private residence to public institution, and in this latest installment Nancy Popp (Los Angeles) and Paul Druecke (Milwaukee) use visual markers--lines, paths, stencils and engraved stones--to reimagine Lynden's history and spaces. In a new installment of Popp's Untitled (Street Performances) and in Garden Path, Druecke's site-specific intervention, they create a physical and conceptual dialogue between their pieces and practices. Both artists have extensive backgrounds with site-specific work, often addressing the history of a place and its cultural implications by illuminating its political and social context and exploring relationships among artist, audience, and institution. Nancy Popp's Untitled (Street Performances) draw on the traditions of durational, corporeal performance and political intervention to explore relations between body and site. Though Popp often performs on urban streets or at building sites--where her interventions are unannounced and sometimes disrupted--at Lynden she has had the opportunity to study the grounds over the course of three residencies to choose a path through the trees. She marks her paths, whether in built or natural environments, with orange mason line, creating large-scale three-dimensional drawings with a material meant to aid bricklayers in keeping their bricks straight. Popp was immediately drawn to Lynden's trees, which she saw as living in the shadows of the monumental sculptures, and to the cracks in the glass of the former swimming pavilion, which make their way into a series of photographs in the gallery. Popp is introducing a new element into her performance at Lynden, a hammock knit from mason line that will hang along the route. Popp layers personal meaning onto the hammock's association with relaxation and sleep. In April 2013 she suffered serious injuries in a motorcycle accident. The period of recovery, in which a community of friends and loved ones cared for her as her bones worked themselves back together, became associated with networks, webs, and knitting. The Lynden hammock is both a collective and public project, involving two knitting assistants and a series of public knitting events around Milwaukee where spectators could take a turn or talk to Popp and her assistants about the project, and Popp could make her own connections to a new community. Paul Druecke has solicited strangers door to door, christened a park and courtyard, rolled out the red carpet, been a benefactor, initiated a Board of Directors, and memorialized the act of memorialization. Recent stints as a resident in Spaces World Art Program and a Mary L. Nohl Fellow resulted in permanent, public installations of bronze plaques that commemorate their own legitimacy; a further iteration of this project was included in the 2014 Whitney Biennial. 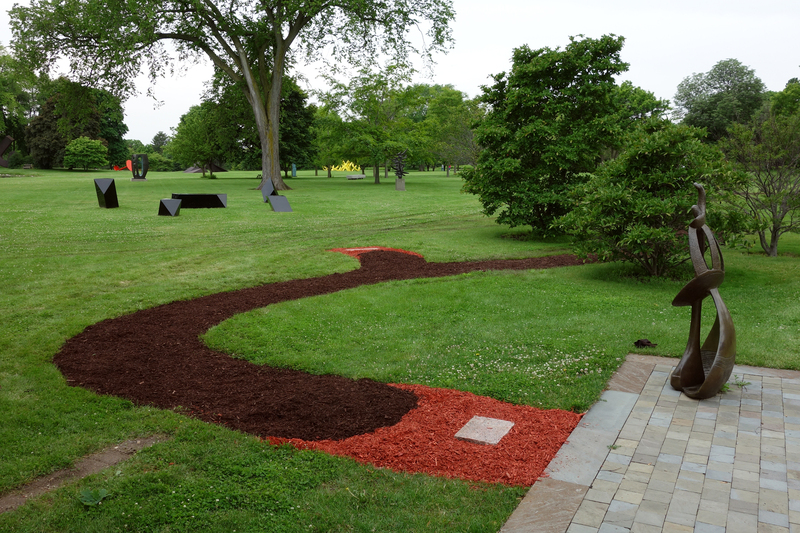 In Garden Path, Druecke--operating from afar--shapes the viewer's experience by insinuating boundaries and choices into his installation. Garden Path winds eastward from the arbor entrance of Lynden's formal garden to the grass verge bordering Brown Deer Road, outside Lynden’s perimeter fence, crossing lawns, a patio, a parking lot and a prairie. It commemorates Vocation by paying homage to the often invisible workers who care for Lynden’s sculptures and grounds; but it also introduces a subtly transgressive perspective by placing a carefully manicured path, complete with planters and engraved markers, in an otherwise path-less sculpture garden, and by ultimately inviting visitors through the boundary fence and “just outside” the garden’s pastoral sanctuary. One steps through the fence and into the middle of Laundry Day, a one-hundred-foot mural that operates as a window into the imagined life of Lynden when it was a private residence, with laundry hanging in what is now a parking lot. Druecke sees a parallel between Garden Path and his series of bronze plaques: “It’s interesting to see how effectively the path inhabits its form, inviting engagement through its vernacular function--visitors have been walking on it since I began installing it several weeks ago--but complicating that engagement with aesthetic considerations that tend to lead one away from individual sculptures at Lynden rather than toward them." The custom carpets in the entrance and gallery, a kind of continuation of the path that reference plats--and therefore boundaries--of different vintages, offer a similar complication, though in a different context. Visitors feel compelled to use the outdoor path, but by locating the carpets indoors, in a gallery, the artist has presented viewers with another set of choices. Druecke is also exhibiting two photographic panoramas and a silk-screened text piece in the gallery. The varied mediums and range of projects resonate with Druecke's interest in time, the existential insecurity that underwrites so much “mark-making,” and an exploratory reworking of boundaries between self and other. Picnic with the Artist: Kyoung Ae Cho: Wednesday, July 2, 2014, 6-7:30 pm. For more information, click here. Hair (collected from April 2011-March 2013), silk organza, muslin, thread, mixed materials Hand felted, hand stitched. Click here to read a review of this exhibition courtesy of the Surface Design Association Journal. The third in a series of exhibitions that examine--in various combinations and with some latitude for digression--women, nature and science. Kyoung Ae Cho presents recent, or recently completed, work. Much of it involves the painstaking collection of things over a long period of time, as in M-a-r-k-i-n-g, which references a Korean custom of collecting one’s own hair as it is shed in the course of daily life; or the slow accretion of small objects to produce a whole, as in her 10-foot-square quilt of artificial flowers. Cho’s practice is never far from nature: she collects fallen leaves and twigs for her hangings and closely observes the flowers and insects in her garden, recording their behavior in startling, almost voyeuristic photographs. To download a copy of the press release for this exhibition, click here. To read Urban Milwaukee's coverage of this exhibition, click here. Kyoung Ae Cho was born in South Korea and earned a BFA from Duksung Women’s University in Seoul. She received an MFA from Cranbrook Academy of Art, Bloomfield Hills, Michigan. She has taught at the Kansas City Art Institute, Cranbrook-Kingswood School, Penland School of Crafts and Haystack Mountain School of Craft, and is currently a professor in the Peck School of the Arts at the University of Wisconsin-Milwaukee. Her work has been exhibited in national and international venues including the North Carolina Museum of Art, Raleigh; Sheldon Museum of Art, Lincoln, NE; Gregg Museum of Art and Design, Raleigh, NC; Morris Museum, Morristown, NJ; San Jose Museum of Quilts and Textiles, CA; Reading Public Museum, Reading, PA; Cheongju Craft Museum, Cheongju, South Korea; Tweed Museum of Art, Duluth, MN; Boulder Museum of Contemporary Art, CO; John Michael Kohler Arts Center, Sheboygan, WI; National Museum of History, Taipei, Taiwan; Project Space Gallery at Montalvo, Saratoga, CA; Soma Museum of Art, Seoul, South Korea; University of Hawaii Art Gallery, Honolulu; the Madison Museum of Contemporary Art, WI; INOVA, Milwaukee, WI; Textilemuseum, Tilburg, The Netherlands; Wisconsin Academy, Madison, WI; Reed Whipple Cultural Center Gallery, Las Vegas, NV; South Bend Museum of Art, IN; Kemper Museum of Contemporary Art, Kansas City, MO; Snyderman Gallery, Philadelphia, PA; Sheehan Gallery, Walla Walla, WA; Dairy Barn Arts Center, Athens, OH; Detroit Institute of Arts, MI; Evanston Art Center, IL; Carnegie Art Museum of Oxnard, CA; and the National Museum of Modern Art, Kwachon, South Korea. Cho's work has been reviewed and featured in numerous publications, among them Textile Fibre Forum (Australia); Fiberarts; Surface Design Journal; American Craft; Monthly CRART (South Korea); Fiber Art Today (Schiffer Publishing, Ltd.); Masters: Art Quilts (Lark Book); Quilt National 2003: The Best of Contemporary Quilts (Lark Books); Contemporary Quilt: Quilt National 1997 (Lark Books); No: Nouvel Object (Design House, South Korea); Art & Craft (South Korea); Fiberarts Design Book IV, VI & VII (Lark Books); and Art Textiles of the World: USA (Telos Art Publishing, England), among others. She is the subject of the monograph Portfolio Collection: Kyoung Ae Cho (Telos Art Publishing, England.) Cho has also received many awards, grants and fellowships, including the Greater Milwaukee Foundation's Mary L. Nohl Suitcase Export Fund for Visual Art Award; the University of Wisconsin-Milwaukee Arts and Humanities Travel Award; a Wisconsin Arts Board Award Fellowship; the UWM Foundation and Graduate School Research Award (2004); the Lillian Elliott Award; a Pollock-Krasner Foundation Grant; and an Art on the Move Grant from the Detroit Recreation Department. Listen to Lynden's executive director discuss the exhibition on WUWM here. Read a post about the exhibit on the NCECA blog here. Read a review of the exhibition by Kat Murrell of ThirdCoast Daily here. This exhibition, organized by Lynden’s Executive Director Polly Morris and ceramicist Linda Wervey Vitamvas in conjunction with the 2014 NCECA conference, focuses on the Mingei tradition in the Midwest, and is built outward from MacKenzie’s work. The exhibition will include work by Bernard Leach and Shoji Hamada, as well as pieces by Randy Johnston, Jan McKeachie Johnston and Mark Pharis, three ceramicists trained or influenced by MacKenzie who have made creative adaptations to the living tradition as it continues to thrive in the Midwest. Quartet,1967/2013 from Lynden Sculpture Garden on Vimeo. Sculptor Forrest Myers moved to New York from the West Coast in 1961 and by the late sixties was becoming known for works both large and small: monumental sculptures like Four Corners and the diminutive Moon Museum that carried the work of Robert Rauschenberg, David Novros, John Chamberlain, Claes Oldenburg, Andy Warhol and Myers himself to the moon on a tiny ceramic wafer attached to the Apollo 12 lander. 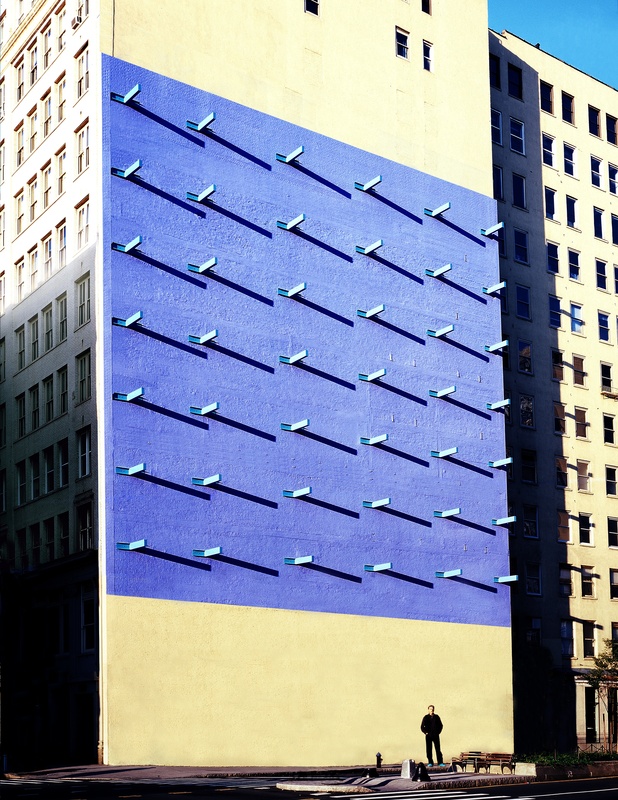 A founding member of the seminal Park Place Gallery in Soho and perhaps best known for The Wall, located on the side of a building not far from the gallery, Myers was part of an emerging downtown scene that ignored traditional boundaries between disciplines and between aesthetics and function. Myers comes to Lynden for the unveiling of Quartet 1967/2013. The early monumental work originally known as Calipers resided on Milwaukee’s lakefront for many years as part of the Milwaukee Art Museum’s collection. 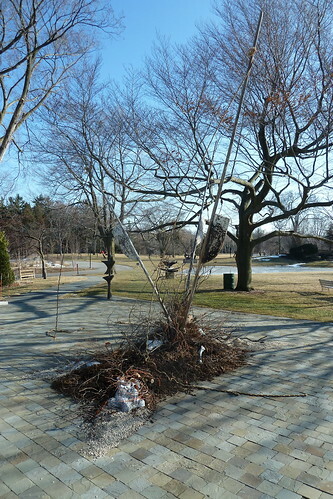 Lynden has worked with Myers to restore, reimagine, and re-site the work in the sculpture garden. 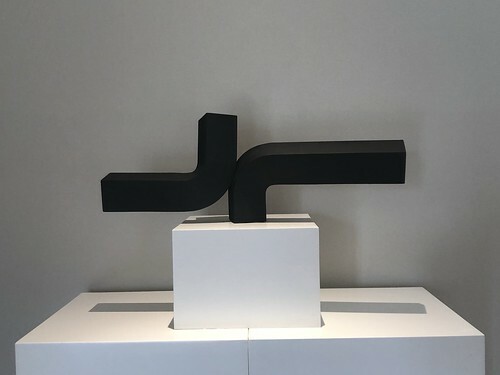 On view in the gallery and on the patio, Domesticated Monumentalism, an exhibition curated by Nicholas Frank of Myers's maquettes, furniture-sculptures, metal paintings, and a new sculptural work. The legacy of sculptor Forrest Myers has been assured, for billions of years. The Wall, 1973, the famous building-sized sculpture on Houston Street just east of Broadway in lower Manhattan, has been officially recognized as a historic site. Myers celebrates the occasion by extending this piece geographically, offering a chance to place 42 new ‘T’ sections, identical to the originals, around the globe. Also on view in the Green Gallery will be Myers’s Moon Museum, 1969, a tiny ceramic wafer featuring etched drawings by six legacy artists of the 1960s: Myers, Warhol, Rauschenberg, Oldenburg, Chamberlain and David Novros. An original copy of this multiple is said to have landed with Apollo 12 at the Mare Cognitum site, and remains to this day the only ‘museum’ on the moon. Gift of the Ralph E. Ogden Foundation, Inc. Participants in the 2013 UWM Art Education Institute: Attentive living: Art, Nature and Place celebrate the completion of the course with a week-long exhibition in the front rooms of Lynden. For more information on the 2013 UWM Art Education Institute, click here. Artist in residence May 27-June 3, 2013. Since 2003 artist Emilie Clark has inserted herself into the works and lives of Victorian women scientists and naturalists including Mary Ward, Mary Treat, Martha Maxwell, and Ellen Henrietta Richards. Treating her studio like a laboratory, Clark literally restages much of the research these women undertook. This investigative activity and her archival research and writing inform a practice that involves painting, drawing, installation and sculpture. Sweet Corruptions departs from the work of Ellen H. Richards—a sanitary chemist who studied air, water, and food. Richards was the first female student and then professor at MIT, and brought the word ecology into the English language. Richardsʼs research—like that of the other scientists Clark has studied—points to transformations of organic material that suggest both fluid categories and vast networks of interconnectivity. Following Richardsʼs air, water and food taxonomy, Clark interweaves them through the provocation offered by Walt Whitman in his poem “This Compost”: “Such sweet things are made of such corruptions.” Elaborating on Richards, Clark sees compost not just as a mundane mode of regeneration, but also as an engine of cosmology. Both Richardsʼ practice and Clarkʼs involve careful testing, sustained empirical inquiry, structured interaction with daily life, and ultimately, world building. Sweet Corruptions transforms Richardsʼs early thinking about ecology into paintings, watercolors, texts, and installations in which the detritus of everyday life becomes a complex and often beautiful cosmology. The watercolors and paintings in the gallery are based, in part, on Clarkʼs process, over the course of a year, of preserving her familyʼs food waste a month for each season. The paintings emerge not as fanciful still lives of garbage heap composting, but rather as intricate compositions that blend full abstraction with carefully rendered studies of the fauna and flora in her daily detritus. Clark meticulously documents the surprising lives of her preserved food scraps, describing in detail such processes as her desiccating and pickling of carcasses, and also elaborates on her shifting understanding of her ongoing practice. Clark’s project at Lynden has been shaped by her visits to Milwaukee over the past year. Her installation in Lynden’s dining room--the one room of the house that remains as it was when the Bradleys were in residence—is a kind of memento mori, re-animating the space with the relics of meals past. Clark’s original plan to build a functional field research station on the grounds grew, after visiting Milwaukee and many of its urban farms last year, to include an aquaponic system (incorporating fathead minnows from Lynden’s Big Lake) and a trial garden. Ellen Richards corresponded with young women interested in science, and Clark is replicating this part of Richards’s practice by collaborating with Alice’s Garden, SeedFolks Youth Ministry, and Urban Underground’s Fresh Plaits program to create the garden. This spring, Clark and her Milwaukee collaborators are planting and tending seeds in their respective cities and exchanging information via email. They will come together to plant the garden during Clark’s residency at Lynden in the last week of May, and the garden will form the basis of an ongoing community collaboration. This exhibition and the projects surrounding it are generously supported by a grant from the Brico Fund. Emilie Clark’s work involves drawing, painting, installation and writing. Following her exhibition at the Lynden Sculpture Garden, her drawings and food detritus will be traveling to the Nevada Museum of Art in Reno for a solo show and her field station will go to the San Jose Museum of Art for Around the Table: Food, Creativity, Community. She will also be featured in the inaugural exhibition at the Children’s Museum of Art in New York. Clark was selected as one of four artists in residence at The Drawing Center for 2013. 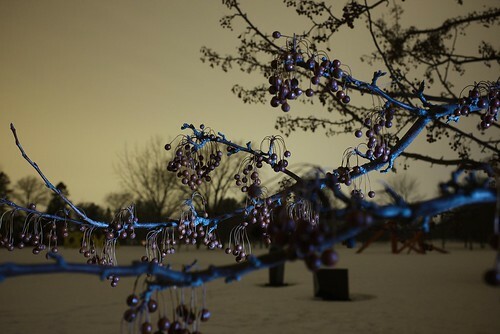 In 2010 Clark was the first Artist in Residence at the Brooklyn Botanical Garden. Her residency culminated in a solo exhibition in the Steinhardt Conservatory. Her work has been in many group exhibitions throughout the United States and Europe, including the Weatherspoon Museum’s 2012 Biennial Art on Paper, the Royal Hibernian Academy in Dublin, Ireland; and, in New York, Wave Hill, Smack Mellon and the Arsenal . Her work has been featured in publications including Bomb, Printed Project and Cabinet Magazine, and has been reviewed in The New Yorker, The New York Times, Huffington Post, Art in America, Art Week, the Village Voice, and Time Out New York. Emilie Clark is the recipient of numerous awards, including the Pollock Krasner award and the Rockefeller Foundation’s Bellagio fellowship. Clark has collaborated extensively with scientists and poets and has been published in numerous books, journals and periodicals. Born and raised in San Francisco, Clark received her BFA from Cornell University in 1991, and moved to New York City from the Bay Area in 1998. She received her MFA from Bard College in 2002. 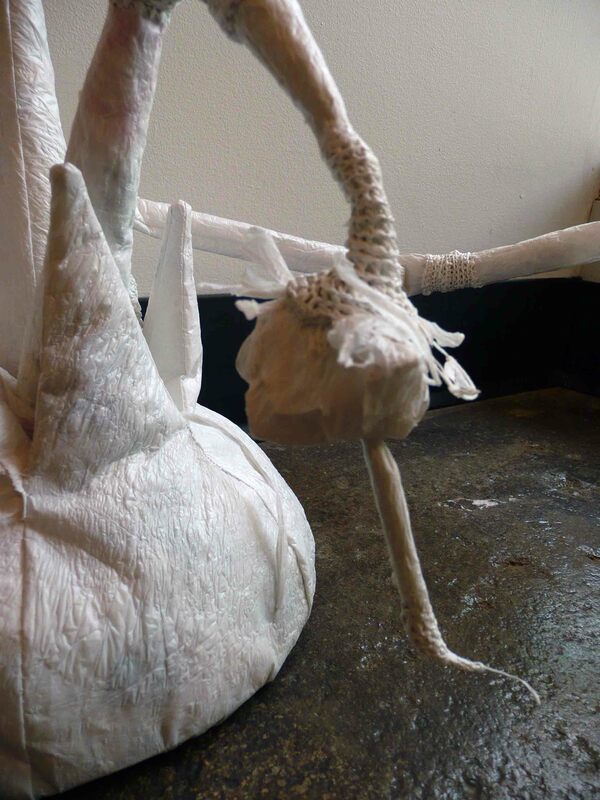 Emilie Clark is represented by Morgan Lehman Gallery, New York, where she exhibited an earlier state of Sweet Corruptions in the fall of 2012. With Sheila Held: Rappaccini's Daughter, Lynden inaugurates a series of occasional exhibitions that will investigate the work of artists who have taken--in various combinations, either directly or obliquely—women, nature and science as their subject. 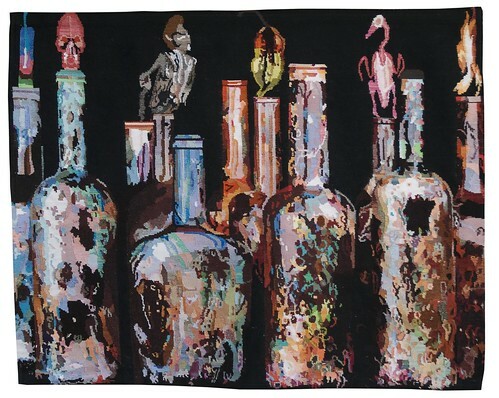 Sheila Held's tapestries have been exhibited in solo and group shows, both locally and around the country. She has won several awards, including a Wisconsin Arts Board Fellowship and multiple prizes in juried exhibitions. She has executed many commissions, both private and public, including pieces for the Medical College of Wisconsin, Marian College in Fond du Lac, and Bethesda Lutheran Homes and Services World Headquarters. She is currently a full-time artist working out of her studio in her home in Wauwatosa, Wisconsin. Feburary 9, 10 am-4 pm: The artists will complete an installation in the front porch during our Third Annual Winter Carnival. View a slideshow of the work here. Jessica Meuninck-Ganger and Nathaniel Stern show the most recent fruits of their collaboration in conjunction with Print:MKE, the SGC International Print Conference. In addition to works that fuse printmaking and video, they will be showing a three dimensional work related to the screen-based work, and will be creating a new installation in the porch windows at Lynden that continues their exploration of surfaces, layers, membranes, matrices and the physical relationship between viewer and object. 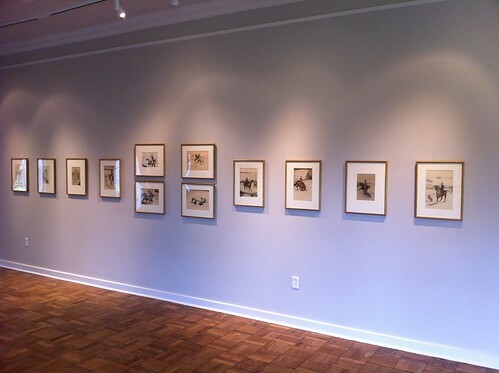 Also on view: prints from the Bradley Family Foundation collection. Read Art City's review of the exhibition here. Jessica Meuninck-Ganger’s prints, artist’s books and large-scale mixed media works have been exhibited in museums and both experimental and commercial galleries near her home in Milwaukee, Wisconsin, nationally and internationally. Her works on paper and books are included in several private and public collections, including the Weisman Museum of Art, the Target Corporation, and the Special Collections at University of Wisconsin-Milwaukee Libraries. She has received residencies and fellowships all over the world, and has provided printmaking and book arts workshops, courses, and programs in North America, South Korea, and South Africa. Meuninck-Ganger received her MFA in Studio Arts from the Minneapolis College of Art and Design in 2004 and currently heads the Print and Narrative Forms area and is an assistant professor at the University of Wisconsin-Milwaukee. Nathaniel Stern is an experimental installation and video artist, Internet artist, printmaker and writer. He has produced and collaborated on projects ranging from interactive and immersive environments, mixed reality art and online interventions, to digital and traditional printmaking, latex and concrete sculpture--often with kinetic parts. He has had solo exhibitions at the Johannesburg Art Gallery, Johnson Museum of Art, Museum of Wisconsin Art, Villa Terrace Decorative Arts Museum, Furtherfield Gallery, University of the Witwatersrand, University of Wisconsin-Milwaukee, and several commercial and experimental galleries throughout the US, South Africa and Europe. His work has been featured in the New York Daily News, PBS.org, Time.com, BBC Radio 4, Wired.com, the Washington Post, CNET, the Wall Street Journal, the Sunday Guardian and Guardian UK, the Sunday Independent, the Daily Mail, Scientific American, Forbes.com, The Huffington Post, NY Arts Magazine, Mashable.com, the Leonardo Journal of Art, Science and Technology, and We Make Money Not Art. Stern holds a design degree from Cornell University, a studio art master’s degree from the Interactive Telecommunications Program (NYU), and received his PhD from Trinity College Dublin. He is an associate professor in the Department of Art and Design at the University of Wisconsin-Milwaukee. Jessica Meuninck-Ganger and Nathaniel Stern’s collaborative print and video work has been exhibited in group and solo exhibitions at commercial and experimental galleries and public museums across Africa, Europe and the Americas. It has been featured in Richard Noyce’s book, Printmaking Beyond the Edge, the Mail and Guardian, the Milwaukee Journal Sentinel, Sunday Times, Art South Africa magazine, Rhizome.org, and several contemporary arts web sites and blogs. Friends Forever is an artwork by Brad Fiore that consists of the permanent installation of smoke detectors in various Milwaukee locations. The devices are installed in the usual manner, discreetly positioned so as not to interfere with the building's day-to-day functioning and aesthetic. A typical visitor to the installation site may not be aware of the device’s significance, or the scope of the network that it signifies, but they are nonetheless protected by its vigilance. This protection, and this inclusion within a network, are gifts, given in the hope that they may be useful to the institution. Leo Michelson, born into Riga’s largely assimilated Jewish community in 1887, created the eight paintings on view in the early 1950s after surviving two world wars, arriving in New York (he became an American citizen in 1945) and entering into a late and happy marriage. Seven of the paintings reflect his love of Paris—his wife was French, he had established his studio in Paris in the 1930s and he had become a French citizen before fleeing the Nazis—and Venice; the eighth, from 1954, is one of a lifelong series of portraits of flowers, a subject that he approached with renewed energy in his late 60s and 70s. Michelson was fascinated by light in motion, and developed a technique of fixing powdered color in superimposed layers to create a surface that resembles fresco or pastel. These eight exuberant works are luminously yellow, with scenes sketched atop the mass of color or forms outlined in fluid black lines. Other artists hung throughout the first floor of the house include Marcel Gromaire (whom Michelson encountered in Paris between the wars), André Brasilier, and Marino Marini. Yevgeniya Kaganovich conceived of grow as a series of durational installations in public buildings throughout the Milwaukee area. 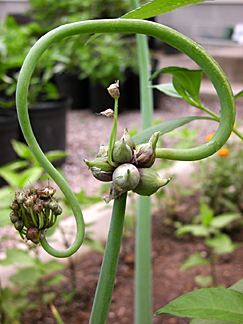 At each location, a system of interconnected plant-like forms, simulating a self-propagating organism in multiple stages of development, would grow over time. These systems are created from a singular material, recycled plastic bags, and their growth rate is determined by the number of bags accumulated in an official recycling bin at each site. The layers of plastic are fused to create a surface similar to leather or skin, molded into plant-like volumes, connected with plastic bag “thread” and stuffed with more bags. Like weeds, these organisms will grow into unused and overlooked spaces: niches, stairwells, and other peripheral and forgotten architectural elements. The project will launch at Lynden on October 28. The public will be able to discover the plant-like forms in Lynden’s interstitial spaces; they will be able to watch them grow and spread over the period of a year or so; and they will be able to contribute to their growth by dropping off their used plastic bags. Various events are planned throughout the project period: an introductory talk by artist Nathaniel Stern (October 28); a day during which Kaganovich and her assistants will occupy our art studio to demonstrate the processes and techniques used in making grow (November 17); and a hands-on workshop where you will learn to manipulate plastic bags as a raw material and make something to take home (January 20). After grow launches at the Lynden Sculpture Garden, Kaganovich will plan subsequent “plantings” at public locations throughout Milwaukee. Public involvement will range from contributing plastic bags for specific locations to participating in workshops. At the culmination of the project, all the forms will be transplanted to Lynden, where they will be exhibited as a combined system before they are, again, recycled. The final exhibition will be accompanied by a catalogue with an essay by Jennifer Johung. Follow Marcasiano's residency on our blog. Colombe Marcasiano is the first artist selected for a month-long residency at Lynden. She will arrive on September 27, 2012 and will spend the month of October onsite. 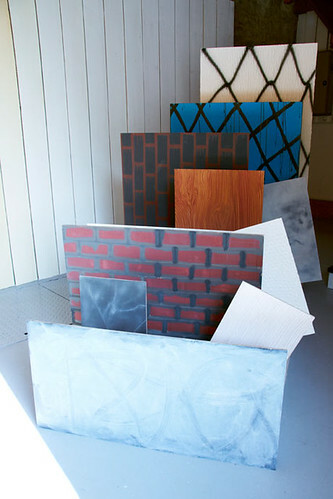 Marcasiano’s sculpture practice, which often employs recycled wood and discarded and short-lived materials such as cardboard; her history of making site-specific temporary work (both indoors and out); and her interest in responding to different conditions make her an excellent first candidate for the residency. During her stay, she will create a temporary outdoor sculpture that will be unveiled at a reception on Sunday, 28 October 2012. While at Lynden, Marcasiano will be connecting with the local community of artists, curators and art students, as well as the community served by the sculpture garden. Marcasiano will offer critiques and talks at the University of Wisconsin-Milwaukee and the Milwaukee Institute of Art & Design, and she will meet informally with visiting K-12 students (it is one of the goals of our education programs to introduce students to living artists and their processes). Members and daily visitors may encounter her on the grounds or in her workspace in the barn. Be sure to say hello! The Lynden Sculpture Garden Residency Program is designed to enable artists to immerse themselves in Lynden’s sculpture collection, its landscape and the surrounding community for an extended period as they make temporary outdoor work. Our primary interest is in three-dimensional work, and in hosting artists who are working, as we are, at the intersection of art and nature. 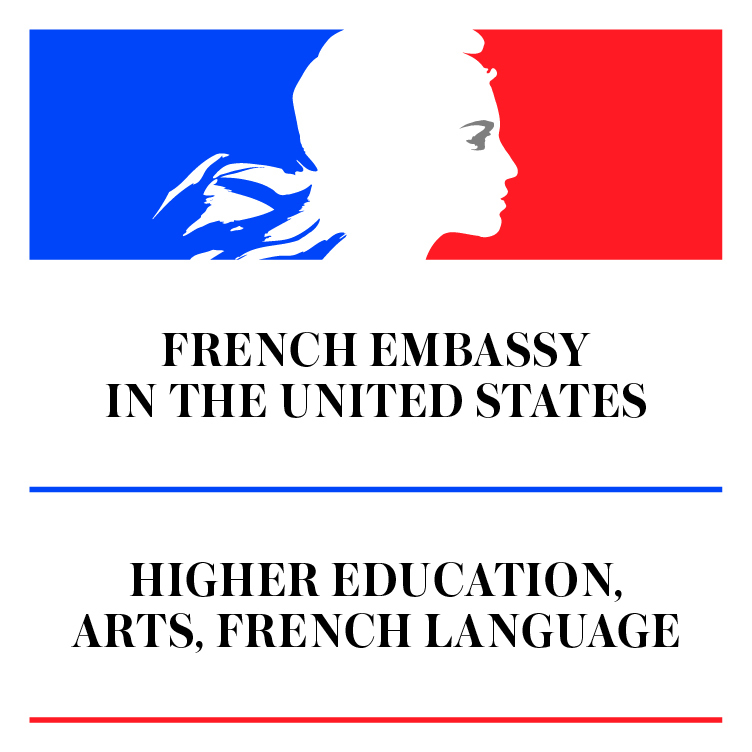 This residency made possible in part with the generous support of the Cultural Service of the Consulate General of France in Chicago. Colombe Marcasiano was born in 1974, and lives and works in Paris, France. She studied at l’École nationale supérieure des beaux-arts in Paris (1996 to 1999) and at De Ateliers in Amsterdam (1999-2001). Recent solo exhibitions include Galerie d’art de Créteil (2011) and Galerie du Haut Pavé, Paris (2009). Her work will be included in the upcoming Jeune Creations 2012 at 104 Gallery in Paris; recent group shows include On n’est pas la pour vendre des cravats at Lezoux; Mots de passe at 6b Gallery, Saint Denis; Petits Volumes at Haut Pavé; as well as exhibitions in Paris, Brussels, Nevers, Istanbul, Amsterdam, London, Montbeliard, Tulette, Ystad and Andrésy. She has been an artist in residence at Clermont-Ferrand, France (2011-2012); FLACC, Genk, Belgium (2009-2010); Chamalot, Moustier Ventadour (2009); and Triangle France, La Friche Belle de Mai, Marseille and Палитра свободы, Yalta, Ukraine (both in 2008). Opening reception: Wednesday, August 8, 5-7 pm. Artists' talk: Thursday, September 20, 5:30 pm. The opening reception and artist talk are both free and open to the public. In this new iteration of the Inside/Outside series, we present two artists, Will Pergl and Shona Macdonald, who are interested in creating “resonant geographies.” They locate themselves in place and space by paying attention to what is around them, and each artist’s work is marked by a certain attentiveness to the mundane, the quotidian—the physical structures that form the background of our visual lives. In their current work, the prosaic, the man-made, and the humdrum are transformed into intricate and compelling objects. 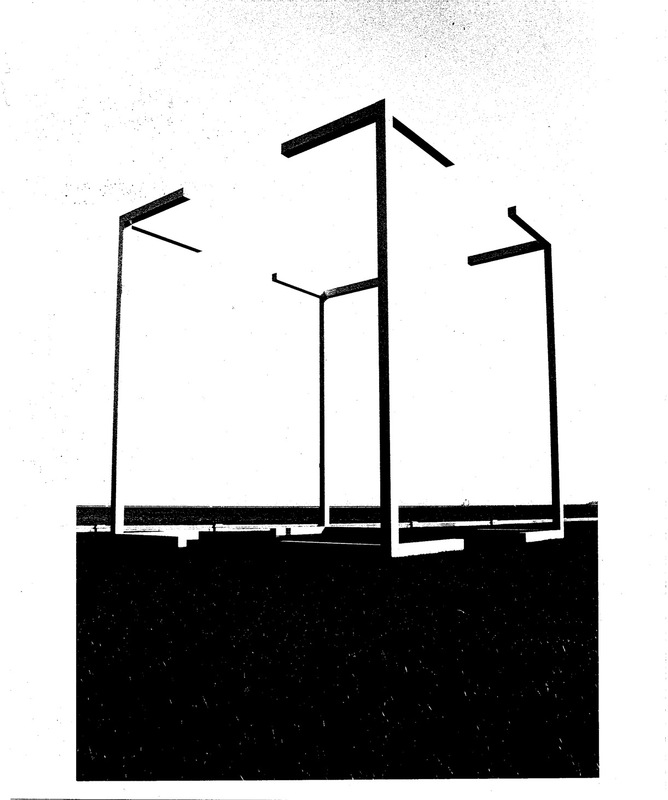 Will Pergl translates and elevates urban structures and objects--cell phone towers, fire hydrants, construction signs--into lyrical, rhythmic forms. Electrical plants, water towers, and propane tanks stranded in the desolate New Mexican desert inform Shona Macdonald’s work, created during a year-long residency in the isolated Southeastern corner of that state. Pergl and Macdonald share a deeply rooted attachment to linear form and an interest in oddities and anomalies. In their work, man-made structures emerge as singular forms against urban Milwaukee skies or barren New Mexican scrub. 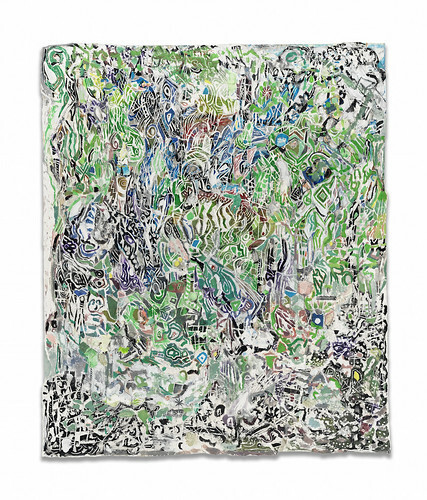 Macdonald will show some of her New Mexican paintings, which explore towers, tanks and fences in barren landscapes, and two of her floor pieces, Desert/Floor and Waves, Shore. Pergl will be making a new outdoor work, and will be responding to different indoor spaces with wood sculpture that investigates the disconnect between the digital and physical realms. Shona Macdonald received her MFA in studio arts in 1996 from the University of Illinois at Chicago and her BFA in 1992 from Glasgow School of Art in Scotland. Solo shows include the Roswell Art Museum, Roswell, New Mexico (2011); Engine Room, Wellington, New Zealand (2010); Proof Gallery, Boston, Massachusetts (2009); Reeves Contemporary, New York (2008); Den Contemporary, Los Angeles (2007); Skestos-Gabriele, Chicago (2005); Galerie Refugium, Berlin, Germany (2002); and Fassbender Gallery, Chicago (1998 and 2000). She has participated in numerous group shows across the United States, as well as in Melbourne, Australia. Her work has been reviewed in Art in America, Art News and New American Paintings. She has been a visiting artist at over forty institutions, including Wimbledon College of Art, London, (1998); the University of Calgary and the University of Alberta, Canada (2002); Cornell University (2006); and Georgia State University, Atlanta (2007). Macdonald was a 2009 recipient of a grant from the Pollock-Krasner Foundation and was a 2010-11 Fellow at Roswell Artist-in-Residence in Roswell, New Mexico. She is an associate professor of studio art at the university of Massachusetts Amherst. Will Pergl is a multi-disciplinary artist based in Milwaukee, Wisconsin. Pergl received his MFA from Cornell University and a BFA from Southern Illinois University. Pergl's sculpture, video and drawing have been shown in over 20 solo exhibits and 30 group exhibitions nationally and internationally. Recent exhibitions include Current Tendencies II at the Haggerty Museum of Art, Milwaukee and a site-specific installation at the Kennedy Center in Washington, DC. Pergl’s video Rock was screened as part of the Milwaukee International One-Minute Video Fair at the Tate Modern in London, and at the Museum of Contemporary Art in Chicago. His work has been reviewed in Sculpture Magazine, Art Papers and Dialogue. Pergl is an associate professor at the Milwaukee Institute of Art and Design and has also taught at Cornell University, Grinnell College and at the University of New Hampshire at Durham. The artists will offer an informal tour of the exhibition at 4 pm. 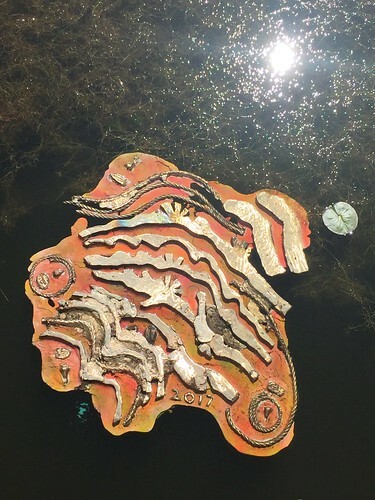 In Gos Sa Mer, their first collaborative endeavor, artists Santiago Cucullu + Ester Partegàs examine the paradoxical relationship between the seemingly natural environment of the Lynden Sculpture Garden and the industrial appearance of the sculptures installed within it. The landscape and sculpture at Lynden give rise to a series of oppositions: nature/culture, organic/industrial, shades of colors/primary colors, roundness/sharpness, to name a few. In Gos Sa Mer, Santiago Cucullu and Ester Partegàs scrutinize these dualities, questioning their polarity and undermining our assumptions about which end is which. 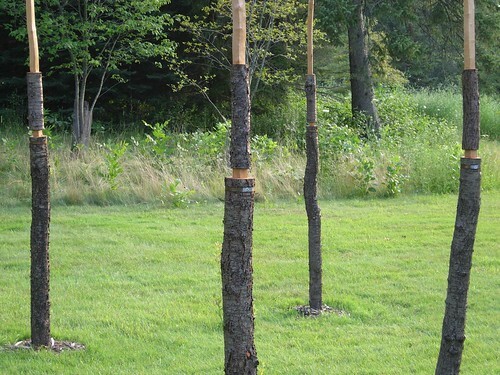 The artists develop an intrinsic dialogue that reverses charges and blurs boundaries: in this dialogue, trees become pillars, and sculptures, living beings. The arboreal landscape appears as a camouflaged installation of vertical structures, modular and architectural, and the sculptures are re-imagined as branches and fruit insinuated among the vertical forms. Moreover, the sculptures’ failure to live up to the Minimalist ideal of purity of form, material, color and installation--the works at Lynden get dirty and scratched, their colors fade; they are in need of constant maintenance—allows Cucullu and Partegàs to suggest that they are alive and in need of human care. The project became an opportunity to explore the dynamic tension that holds these opposing elements together. The structure Cucullu and Partegàs discovered resembled a cobweb, made up of symbiotic relationships, familiar and sympathetic contrasts, accepted contradictions, humorous incongruities, and ambiguities. As the plan for the installation evolved, Partegàs began to associate the ideas of interrelations in space, of interdependency, and of simultaneous unity and dispersion with the word “gossamer.” In its syllables she heard something that “sounded like it could be a Berlin-based techno band, or a king from a fairy tale.” Cucullu immediately responded with Gossamer, the Looney Tunes monster created by Chuck Jones. Another living paradox, Gossamer is the embodiment of strength and delicacy. Terrifyingly huge and menacing, he is covered in fine hair (in a shade of red that a Minimalist would love) that signals that he is also a vulnerable and kind-hearted creature. 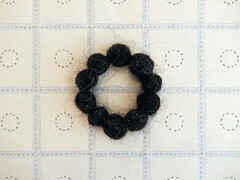 “His fingernails,” the artists note, “are painted as if they were the screws that hold that mass of thin, delicate hair in place.” In addition to the collaborative installation in the gallery, Gos Sa Mer includes six prints by Santiago Cucullu and Ester Pargegàs's hand-painted T-shirts. This exhibition was made possible in part through the support of the Viriginia Commonwealth University Sculpture + Extended Media Department. SANTIAGO CUCULLU (Buenos Aires, Argentina, 1969) lives and works in Milwaukee, Wisconsin. He holds an MFA from The Minneapolis Institute of Art and Design (1999) and a BFA with a concentration in painting from the University of Hartford, Connecticut (1992). Selected solo shows include: Galeria Labor, Mexico City; Galleria Umberto Di Marino, Naples, Italy; The Green Gallery, Milwaukee (2011); Loock Galerie, Berlin (2008); Museum of Contemporary Art, San Diego, California (2006); Mori Art Museum, Japan (2004); Julia Friedman Gallery, Chicago (2003); Franklin Art Works, Minneapolis (2002). Selected group exhibitions include: Hendershot Gallery, New York (2011); K21, Dusseldorf, Germany and Biennial of the Americas, Denver (both 2010); Rowley Kennerk Gallery, Chicago (2009); Fort Worth Contemporary Arts, Texas and Museum of Modern Art, New York (both 2008); Calouste Gulbenkian Foundation, Lisbon, Portugal (2007); Singapore Biennial and Camden Art Center, London (both 2006); Musée d’Art Moderne de la Ville de Paris and Shanghai Biennial, China (both 2005); Whitney Museum of American Art, New York (2004); Fondazione Sandretto Rebaudengo, Turin, Italy (2003); Walker Art Center, Minneapolis (2000). Cucullu is represented by Galeria Labor, Mexico City; Galleria Umberto Di Marino, Naples; Loock Galerie, Berlin; and The Green Gallery, Milwaukee. ESTER PARTEGÀS (La Garriga, Barcelona, 1972) lives and works in Richmond, Virginia. She holds an MFA from Universitat de Barcelona (1996) and a Visual Arts Diploma in Multimedia Art from the Universität der Kunste, Berlin (1998). Selected solo shows include: Foxy Production, New York; Christopher Grimes Gallery, Santa Monica, California (both 2010); Aldrich Museum for Contemporary Art, Ridgefield, Connecticut (2008); Museo Nacional Centro de Arte Reina Sofia, Madrid (2007); Virginia Commonwealth University, Richmond, Viriginia (2006); Centre d’Art Santa Mònica, Barcelona; Hallwalls, Buffalo, New York (both 2003); Rice University Art Gallery, Houston (2002). Selected group exhibitions include: Whitechapel Gallery, London; Centro Artes Visuales Helga de Alvear, Cáceres (both 2011); Socrates Sculpture Park, Long Island City, New York; Denison Museum, Granville, Ohio (both 2010); Brooklyn Academy of Music, New York; Macro Future, Depart Foundation, Rome; Foundation CaixaForum, Madrid (all 2009); 2nd Moscow Biennale (2007); Weatherspoon Art Museum, Greensboro, North Carolina; Walker's Point Center for the Arts, Milwaukee; Cercle (all 2006); SculptureCenter, New York (2005); Queens Museum of Art, New York (2003); Whitney Museum of American Art at Altria, New York, Arnolfini, Bristol (both 2002), Public Art Fund, Brooklyn, New York (2001). Partegàs is represented by Foxy Production, New York; Christopher Grimes Gallery, Santa Monica, California; Galería Helga de Alvear, Madrid; and NoguerasBlanchard, Barcelona. She is on the faculty of the Sculpture + Extended Media Department at Virginia Commonwealth University, Richmond, Virginia. 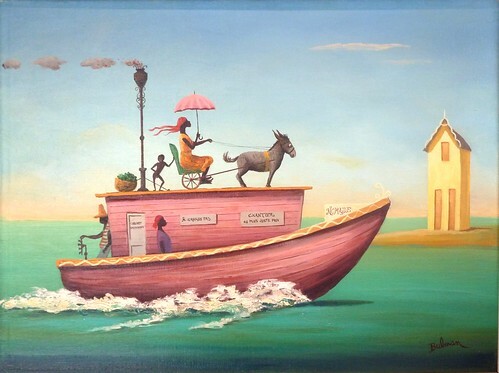 Orville Bulman, Bateau Rapide (purchased 1957). This exhibition examines the role played by Haiti in the imagination of Orville Bulman (1904-1978), a Midwestern businessman-turned-artist, and his patrons. Set primarily in the 1950s, when Haitian cultural export—particularly of what is now referred to as first generation Haitian art--was on the rise and the country was opening itself to tourism, and when Americans were awash with a postwar optimism that celebrated America’s political and economic power, it tells us relatively little about Haiti at mid-century and a great deal about the ways Americans saw themselves and the rest of the world. As an artist, Orville Bulman was not so much self-taught as self-made; he worked assiduously to create and perpetuate his own narrative, and he made liberal use of contemporary American stereotypes of businessmen and artists to define his niche in the art market of the ‘50s and ‘60s—a market in which Abstract Expressionism was the reigning avant-garde. For Bulman, Haiti—which he visited for 12 days in 1952--was the source of a visual vocabulary, a style, and a sense of himself as a professional artist that sustained his career for more than 25 years. Also on view: watercolors of Haiti by Emilio Sanchez. Haiti and the Midwestern Imagination is held in conjunction with Haiti 2012: Dreams and reality € pays rêvé, pays réel: (March 5-9, 2012), a celebration of contemporary Haitian art, cinema and literature. Two years after a catastrophic earthquake devastated Haiti, this conference, the first of its kind in the United States, focuses on the vibrancy of Haitian cultural production in the twenty-first century by highlighting three art forms in three days: cinema, visual arts, and literature. The presenters include six prominent, award-winning Haitian filmmakers, artists, writers and journalists living in Haiti or in exile. More details on the conference here. Orville Bulman was born in Grand Rapids, Michigan, in 1904. During Bulman’s childhood, his father invented products for the retail industry including a twine dispenser and a paper cutter that became the foundation of the successful E.O. Bulman Company. The younger Bulman, who drew cartoons as a high school student, spent the year following graduation in Chicago, working as a newspaper cartoonist and studying briefly at the Art Institute. He returned to Grand Rapids to work in the family business, where he continued to draw cartoons and illustrate ads while pursuing painting as an avocation. It was not until the late ‘30s that his paintings--cityscapes and genre scenes--began to see the light of day. Around 1946, Bulman began to rearrange his life to put painting, rather than the family business, at its center. He started to spend his winters in Palm Beach, Florida, explaining that the chronic pain from earlier neck injuries required a warm climate for recovery. He continued to direct his businesses (there were now two companies back in Grand Rapids) from Palm Beach, and by the early ‘50s he had become president of the Bulman Manufacturing Company, a position he retained until 1975, despite the sale of the company in 1971 and of his Grand Rapids home in 1974. Early on, Bulman sought out Eric Lundgren, an artist in West Palm Beach, as a teacher; he also spent brief periods at Oxbow in Saugatuck, Michigan and the Woodstock Art Colony in New York. At the latter, he formed a friendship with Adolf Dehn, an artist who spent time in Haiti in 1948 and 1949, and who may have piqued Bulman’s interest in the island and Vodou. By 1950 Bulman had launched a career of solo shows at galleries that continued unabated until his death in 1978. While his earliest shows were in Palm Beach, Grand Rapids, Madison, Wisconsin, Wilmington, Delaware and Knoxville, Tennessee, by 1955 he was exhibiting in New York (first at the Grand Central Art Galleries, and then at the Hammer Galleries) with Chicago, Paris and Los Angeles following before the end of the decade. By his own account, he had had 40 one-man shows and sold about 2000 paintings by 1975. Emilio Sanchez was born in Camagüey, Cuba in 1921. He moved to New York City in 1944 and began studying at the Art Students League. Though he lived in New York until his death in 1999, it was in Cuba that he became fascinated with the play of light and shadow on colored forms, a dominant characteristic of his works. These watercolors are among his early stylized, figurative works. In the 1960s he moved toward abstraction, making architecture his focus. His mature architectural works are stripped down, simplified forms that convey universal meaning; the paintings often capture the effect of light on color. Sanchez had over sixty solo exhibitions and was included in numerous group shows in museums and galleries in the United States, Latin America and Europe. His art is in private and public collections including the New York Museum of Modern Art, the Metropolitan Museum and the Philadelphia Museum of Art. He received first prize at the 1974 Biennial in San Juan, Puerto Rico. The Lynden Sculpture Garden hosts the Wisconsin Visual Artists juried exhibition featuring the works of WVA Southeast Chapter members. The exhibition is juried by Fo Wilson, Assistant Professor at Columbia College in Chicago. Participating artists incude Rïse Andersen, Diane Anderson, Allen Caucutt, Dara Chappie, Valerie J. Christell (with a solo work and a collaborative installation with Gary John Gresl), Dagmara Costello, Sally Duback, Audrey Dulmes, Tom Eddington, Pat Hidson, Angela Laughingheart, Darron Lillian, Jim Maki, Gene Mihleisen, Gary Niebuhr, Sandra Nowicki, Mark Overs, Kris Reicher, David Sear, Colette Odya Smith, Jean D. Sobon, Jane Boller Stoebel, Tori Tasch, Bilhenry Walker and Rochelle Whiteman. Four prizes were awarded: Rïse Andersen, “Roundabout” (First Prize), Diane Anderson, “Death of the Garter” (Second Prize), Valerie J. Christell & Gary John Gresl, “Mound of Being – Disintegration” (Third Prize), and Gary Niebuhr, “Horse Flies” (Merchandise Award). 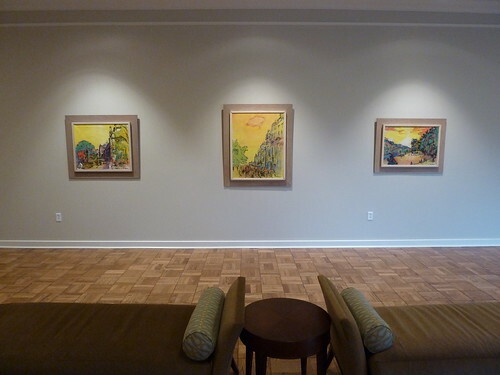 The work hangs throughout the first floor of the house and includes two works on the patio. Fo Wilson graduated with an MFA from the Rhode Island School of Design’s Furniture Design program in 2005 with a concentration in Art history, Theory and Criticism. Prior to her graduate studies, she ran her own graphic design consultancy with offices in New York and the San Francisco Bay area. She is currently an Assistant Professor at Columbia College in Chicago, and previously taught at the University of Wisconsin Milwaukee, Rhode Island School of Design, the University of Massachusetts and Dartmouth, as well as the California College of Art (formerly CCAC) and Parsons School of Design. She writes and lectures about art, design and craft to international audiences. 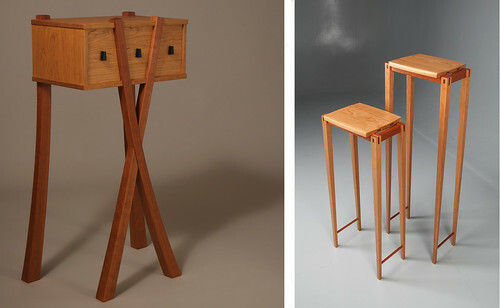 Her furniture-based work is exhibited nationally, and her design work is included in the collection of The Cooper Hewitt National Museum of Design. Wisconsin Visual Artists (WVA) is a not-for-profit membership-based organization made up of visual artists working in a wide variety of media and supporters of Wisconsin Art. They are united to advance opportunities and services for artists and the general public, and are committed to the importance and value of art and its creation in our society. Small sculptures from the collection by Barney Bright, Mary Callery, Émile Gilioli, Milton Hebald, Sergio Lanzavecchia and James Rosati, and a pastel by Hans Hartung. Peg and Harry Bradley began collecting monumental sculpture in 1962 with the purchase of Gerhard Marcks’s The Bremen Town Musicians (1951). In the decade prior to that, the Bradleys had been acquiring small sculptures, as well as paintings and works on paper, and Peg Bradley continued to collect small sculpture after she began to actively seek large works for Lynden. The eight works in this exhibition give us some insight into Peg Bradley’s interests and collecting habits. She bought from galleries with whom she had long-standing relationships—M. Knoedler, Fine Arts Associates, Galerie Louis Carré--and it is likely that she purchased particular pieces after she saw them in exhibitions on 57th Street or in the 8th arrondissement. Most of the work was new, and made by often peripatetic 20th-century European and American artists (Mary Callery and Milton Hebald left the United States for Paris and Rome, respectively; Hans Hartung made his way to Paris after completing his art studies in Germany). As this small sample shows, Peg Bradley collected both figurative and abstract works (sometimes both from the same artist) and was broad-minded about materials; in addition to these sculptures, other works in the collection are made of various metals, stone, glass and plexiglass. James Rosati is represented in the outdoor collection by his untitled Corten steel sculpture of 1975/1976. Leda was purchased nearly 20 years earlier, in 1958, from Fine Arts Associates in New York. The piece was part of a group exhibition at the gallery in May, and was featured in the photograph that accompanied the review in The New York Times. 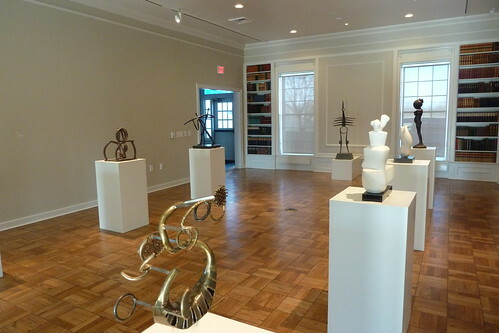 The exhibition included several artists, both sculptors and painters, whose work Mrs. Bradley collected. Paris in 1959. 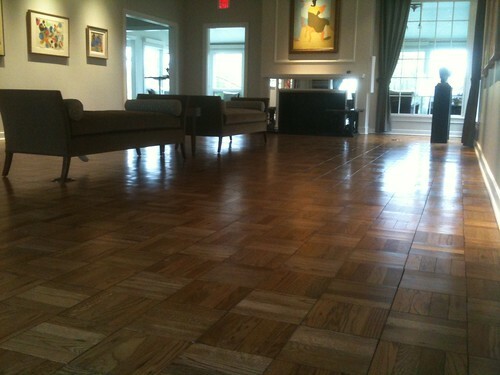 This was a gallery that Mrs. Bradley had patronized previously, buying three paintings by Marcel Gromaire early in 1952. In 1961 she returned to purchase a second work by Gilioli, Le Petit Glacier. Four additional Gilioli works may be found in the Bradley Collection at the Milwaukee Art Museum. By 1965, when Mrs. Bradley purchased The Budding Crisis in Rome, she had acquired large-scale works by Aldo Calo, Henry Moore and George Rickey. She came across Sergio Lanzavecchia, a joiner and self-taught “scrap iron wizard,” early in his career—he had just begun showing his sculpture in 1962—and she bought a second work, The Garden, on the same visit. This work is now in the Bradley Collection at the Milwaukee Art Museum. Hebald’s Scooter was acquired in Rome in 1966. Hebald, who was born in New York City, travelled to Italy in 1955 on a Prix de Rome fellowship and didn’t return until 2004. He is known for his figurative works and for many public commissions, including the 220-foot Zodiac Screen (1961), a series of twelve monumental bas-relief representations of the Zodiac on what was then the Pan American World Airways terminal at Idlewild (now Kennedy) Airport. Barney Bright’s Sara, originally part of the outdoor sculpture collection, was purchased from the Naples Art Gallery in Florida in 1968. It moved indoors when the house was renovated in 2009-2010. 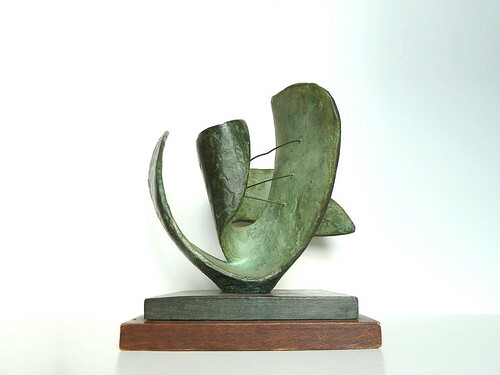 Peg Bradley began collecting Mary Callery’s small sculptures in 1961. Callery is one of several female sculptors in the collection—Barbara Hepworth, Linda Howard, Marta Pan and Beverly Pepper all have works on the grounds. 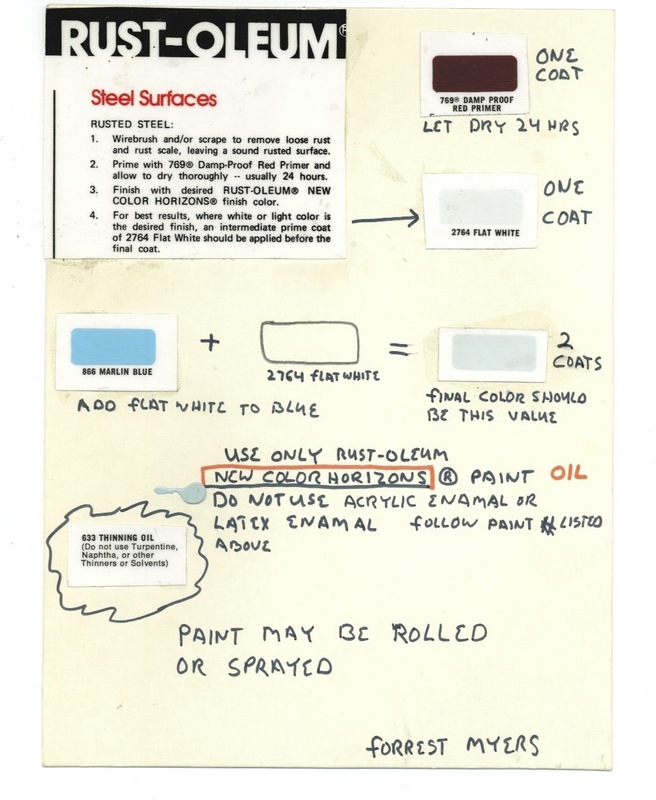 In March/April 1961, the Knoedler gallery in New York produced Symbols, an exhibition of Callery works; it included Composition, The Letter S. Christian Zervos, writing in the catalogue and making an argument for Callery as an artist equally in thrall to “reality, sign and technique,” noted that “For Callery the sign has the same power as a living model of creating tension in the depths of the unconscious, of provoking unexpected stimulations, of containing a host of formal combinations.” Half a year later, Mrs. Bradley returned to Knoedler to purchase an earlier figurative work, Two Sailors. Knoedler had another show of recent Callery sculpture, covering the years 1961-1964, in early 1965. Here one could see the letters E, H, J, P and two versions of Z. The following year Mrs. Bradley purchased Alphabet Letter J, No. 2 (1962). The opening will include a curators’ ambulatory talk, a chance to sample the specially-brewed beer, and Hannah Weinberger’s participatory concert at 6:15 pm. A video screening is planned for October. Dressing the Monument is the culmination of an 18-month series of exhibitions entitled Inside/Outside. Pairs of artists were selected to exhibit work in the gallery and to undertake temporary installations on the grounds. The Lynden Sculpture Garden opened to the public in May 2010, and by choosing Inside/Outside as our inaugural theme, we hoped to initiate a dialogue between the new indoor gallery and the environment--both sculpture and nature--beyond its walls; to explore Lynden’s transition from a private, domestic space to a public space; and to define Lynden’s new position within the art community. The central challenge of a permanent outdoor collection is its permanence, and though the changing seasons and the passage of time (trees grow, flora and fauna evolve, Corten degrades) introduce elements of change, Inside/Outside has provided a series of opportunities for artists to reframe the collection and to re-present it—and the individual works in it--to the public. This establishes the basis for ongoing engagement with Lynden and its collection. With Dressing the Monument, an exhibition of temporary sculpture and performances across the grounds and in the gallery, we expand the dialogue to include artists from beyond the region and the United States, and we re-establish Lynden as a venue with an international scope and a continuing commitment to contemporary art. Dressing the Monument features the first institutional collaboration of Tobias Madison & Kaspar Müller, and Hannah Weinberger’s first site-specific exhibition, in the United States. These Swiss artists will be joined by nine artists from New York and the American Midwest in an exhibition that responds to Lynden’s permanent collection of monumental sculpture. Participating artists: Tobias Madison & Kaspar Müller (Switzerland); Hannah Weinberger (Switzerland); Nicholas Frank (Milwaukee); Michelle Grabner & Brad Killam (Chicago); Lucas Knipscher (New York); John Miller (New York) & Richard Hoeck (Vienna); David Robbins (Milwaukee); and Anicka Yi/Matt Sheridan Smith (New York). The exhibition is curated by Piper Marshall, assistant curator, Swiss Institute, NY, and John Riepenhoff, Green Gallery, Milwaukee, in association with Polly Morris, Lynden’s executive director. The Lynden collection offers a snapshot of monumental sculpture production in the ‘60s and ‘70s. The works are meant to be permanent; they eschew pedestals, emerging from the earth; they are often made from industrial materials; and their size amplifies the heroic role of the individual artist. Dressing the Monument reframes this collection, and individual works within it, by challenging these modernist tenets, and most importantly the aspiration —audacious, arrogant or simply optimistic— toward permanence. If optimism fueled the impulse to create large, permanent works in the ‘60s and ‘70s, the artists in this exhibition are more likely to rechannel that optimism into collaborative and collective experiences; to dwell on memory and the ephemeral by charting the traces of the just-happened; and to embrace the rich social, cultural and political meanings of their throwaway materials. They celebrate the fragmentary and the in-between, deploying strategies of impermanence in their dialogue with the permanent work. Sculptures will hang from trees, be conjured from thin air, or take the form of a sensation: the taste or smell of a pheromone-laced beer, the sound of untrained musicians. Beer craft for the Anicka Yi/Matt Sheridan Smith project by Aran Madden of Furthermore Beer. This exhibition is supported in part by the Swiss Arts Council Pro Helvetia, American Fantasy Classics, Good Day Sir Studios and Furthermore Beer. NICHOLAS FRANK (Milwaukee) is an artist, writer and curator. 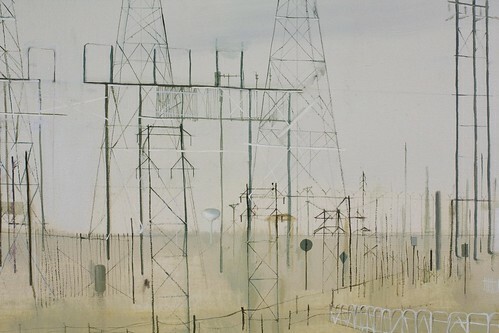 Recent solo projects: Poor Farm, Manawa, WI; Green Gallery, Milwaukee; Western Exhibitions, Chicago. Group projects: Picturing the Studio, School of the Art Institute of Chicago, Halbjahresgaben at Tanzschuleprojects, Munich and 200597214100022008 at Laurel Gitlen, NY. MICHELLE GRABNER is an artist, writer and the chair of the Painting and Drawing Department at The School of the Art Institute of Chicago. She has exhibited her work at Musée d´art Grand-Duc Jean, Luxembourg; Stadtgalerie, Keil; Kunsthalle, Bern; Walker Art Center, Minneapolis; Daimler Contemporary, Berlin; Midway, Minneapolis; Rocket, London; INOVA, Milwaukee; Southfirst, Brooklyn; Gallery 16, San Francisco; Minus Space, Brooklyn; Shane Campbell Gallery, Chicago; The Milwaukee Art Museum; Anne Mosseri-Marlio, Zurich; Bricks and Kicks, Vienna; Turbinehallerne, Copenhagen; Ulrich Museum of Art, Kansas; Leo Koenig Gallery, NY; Harris Lieberman Gallery, NY. With her husband, BRAD KILLAM, Grabner founded The Suburban, an artist-run project space in Oak Park, IL, and the Poor Farm, a not-for-profit exhibition space in rural Wisconsin. LUCAS KNIPSCHER is based in New York. Recent group shows: Swiss Institute, NY; Vox Populi Gallery, Philadelphia; Sculpture Center, NY; and Balice Hertling, Paris. TOBIAS MADISON (b. 1985 in Basel, lives and works in Zurich) & KASPAR MÜLLER (b. 1983 Schaffhausen, lives and works in Zurich and Basel). Their collaborative work has been featured at the Kunstverein Munich (2010), Johan Berggen Gallery, Malmo (2010); and The Modern Institute, Glasgow. Madison’s recent solo shows include Sammlung Haubrok, Berlin and The Vanity, Los Angeles (2011); Haus Konstruktiv; Frame, Frieze Art Fair, London, Æuroasia, Kunst Raum Riehen and Hydrate + Perform / Yes I Can! The Movie: A Preview, Swiss Institute, New York (2010). Madison co-runs New Jerseyy and the Basel-based published house Used Future. Müller’s recent solo shows include Société, Berlin and Circuit, Lausanne (2011); Manor-Kunstpreis Schaffhausen, Museum zu Allerheiligen, Schaffhausen (2010); and Paloma Presents, Zürich, and New Jerseyy, Kunsthaus Baselland, and Galerie Nicolas Krupp, Basel (2009). JOHN MILLER (b. 1954, Cleveland, Ohio; lives and works in New York and Berlin). Recent solo exhibitions include Galerie Christine Mayer, Munich, Galerie Christian Nagel, Cologne, Galerie Barbara Weiss, Berlin (2010); and Kunsthalle Zürich (2009). RICHARD HOECK (b. 1965 in Hall, Austria; lives and works in Vienna). Recent solo exhibitions (2010) include ORF Landesstudio Tirol; Museum of Art, Ningbo, China; and Gallery Johann Widauer, Innsbruck. More information on their collaborations (1998-present) at www.lownoon.com. Artist and writer DAVID ROBBINS investigates the intersections between art, entertainment, and comedy. As an artist he is best known for Talent, eighteen "entertainer's headshots" of contemporary artists including Cindy Sherman, Jeff Koons, Jenny Holzer and others, and The Ice Cream Social, a project comprising installations, performances, a novella, and a TV pilot. His sixth book, Concrete Comedy: An Alternative History of Twentieth-Century Comedy, has just been published. HANNAH WEINBERGER (b. 1988, in Filderstadt, lives and works in Basel and Zürich). Her work has been exhibited at Kunsthal Charlottenborg, Copenhagen, and Alte Fabrik, Rapperswil (2011); Kunsthalle Basel, Karma International, Zurich, The Modern Institute, Glasglow, and Kunsthaus Glarus (2010). Recent performances include Kunsthal Charlottenborg; Theatre de L‘Usine, Geneva; Jam Session, Museumsnacht, Kunsthalle Basel (2011); Regionales Konzert, The Village Cry, Kunsthalle Basel and Transdisziplinäres Konzert, ZHdK, Zurich (2010). ANICKA YI is based in New York City. Her work has been exhibited at 179 Canal (solo), White Columns, Gavin Brown's Enterprise, The Artist's Institute, X Initiative, Karma International, among others. Upcoming projects: a solo show at 47 Canal, NY and a group show at Rudiger Schottle, Munich. MATT SHERIDAN SMITH (b. 1980, Red Bank, NJ) lives and works in New York City. Recent solo and two-person exhibitions include galeria kaufmann repetto in Milan and the Contemporary Art Museum St. Louis. Selected group exhibitions include SculptureCenter, The Drawing Center, Galerie Lelong, Andrew Kreps, and Gavin Brown's Enterprise in New York, Karma International in Zurich, and the Contemporary Museum, Baltimore. His first public art commission is on view in downtown Brooklyn as part of the Public Art Fund's Total Recall exhibition. Toulouse-Lautrec’s mid-century popularity was fuelled by the publication of Pierre La Mure’s novel about the artist’s life, Moulin Rouge (1950), Peter Riethof’s film, Toulouse-Lautrec Painter of the Parisian Bohème (1951), and John Huston’s film adaptation of the La Mure novel (1952). Works by Toulouse-Lautrec were reproduced in national magazines such as Newsweek: it was the dawn of the golden age of advertising and the artist’s bold and groundbreaking posters, advertising everything from bicycle chains to chanteuses, were increasingly admired. The Metropolitan Museum had works by Toulouse-Lautrec on display in the print galleries in 1951 to commemorate the anniversary (many of their best lithographs had come from the estate of Alfred Stieglitz), and a small exhibition, from the collection of Mr. and Mrs. John Davies Stamm of New York, landed at the Milwaukee Art Institute in late 1954. There was a major show at the Philadelphia Museum of Art in 1955 (where Harry Bradley purchased thirteen posters) that then traveled to the Chicago Art Institute and the Museum of Modern Art the following year. MoMA added extra hours to its schedule to accommodate the crowds during the first week. In addition to the Philadelphia purchases, the Bradleys bought their Toulouse-Lautrec works from at least four New York galleries: Fine Arts Associates, French & Company, M. Knoedler & Co., and Kleeman Galleries. Knoedler had shown Toulouse-Lautrec lithographs from the collection of Ludwig Charell in 1950 to benefit the Musee d'Albi, the Toulouse-Lautrec museum. Of the many works by Toulouse-Lautrec that the Bradleys purchased, several went to the Milwaukee Art Museum, several hung at the various Zita’s locations (where, according to a newspaper article, art could be found in Mrs. Bradley’s “private office, in dressing rooms, in halls and even in the stock room”) and others remained in the Bradley Family Foundation Collection. Some of these works were originals, and some were reproductions; among them was a suite of 22 prints from the two volumes known as Au Cirque (At the Circus) purchased in 1951. Taken from a series of 39 drawings Toulouse-Lautrec made from memory in 1899 while confined to the St. James Clinic in Neuilly for his alcoholism, these lithographic reproductions were family favorites, hanging at Lynden and at Jane Bradley Pettit’s home. Many lithographic reproductions of the drawings were made over the years, beginning around the turn of the century, and this group of prints appears to come from at least two different editions. The majority bear the imprint of the Librairie de France. Goupil published an edition that included 22 drawings (Volume I) in 1905; Librairie de France published the remaining 17 drawings as Volume II around 1913. In 1932 Librairie de Fance published an edition of 200 of the complete set; the plates were made by their studio. Michael, Cora. “Henri de Toulouse-Lautrec (1864-1901)”. In Heilbrunn Timeline of Art History. New York: The Metropolitan Museum of Art, 2000-. http://www.metmuseum.org/toah/hd/laut/hd_laut.htm (May 2010). Mayor, A. Hyatt. “Toulouse-Lautrec.” Metropolitan Museum of Art Bulletin, New ser., v. 10, no. 3 (November, 1951): 89-95. Drams, Whits, Scintillas, a multimedia installation incorporating video, sound and drawing by Lynn Tomaszewski and Kevin Schlei, brings the garden into the gallery and spreads back out onto the grounds. Tomaszewski begins with video of visitors walking in the sculpture garden and recontextualizes it as part of a projected generative drawing in the gallery, and Schlei creates an outdoor multi-channel sound piece in dialogue with Tony Smith’s The Wandering Rocks (1967-1969). As Tomaszewski and Schlei reintroduce often overlooked elements of daily life into the gallery and sculpture garden, they reframe and reanimate these spaces, allowing us to see them anew. As in much of her recent work, Tomaszewski begins with video of mundane behavior and shifts the context to infuse the quotidian with both longing and anxiety. “The rhythms of daily life play out under the suggestion of ominous consequences,” she notes. In the gallery installation, figures walking in the garden approach and mirror viewers watching the projected image. Tomaszewski’s interest in the way technology influences perception is reflected in two series of drawings in the gallery, one white and one black. The drawings explore the human desire for knowledge and understanding, as well as the absurdity and even futility of that pursuit. The white drawings of swarms are taken from YouTube videos of flocking starlings. The black drawings began with images of supernovae from the Hubble telescope. For Tomaszewski, the drawings delineate the perceptual distance between the actual event and the viewer: a distance first eradicated by technology and then re-created by it. Lynn Tomaszewski's award-winning work has been shown in solo and group shows throughout the United States and Europe. Her paintings, drawings, installations, and video work explore how technology alters perception. Large groups of figures are presented as a unified field and in this way function as visual field theory rather than portraiture. Tomaszewski’s work is in the public collections of the Walker Art Center in Minneapolis, Minnesota and the Center for Contemporary Art in Sacramento, California. She is a professor at the Milwaukee Institute of Art and Design. Kevin Schlei composes electronic and acoustic music that plays with sounds through systems of manipulations. His works include live algorithmic pieces in multichannel environments, interactive installations, and custom software instruments. Recent works include Close Up Distance, an ambisonic surround sound piece that pushes the illusion of multi-space shifting, and Languid Flow of Imaginary Vapors, where saxophones melt with wispy synthesized tones to create a fog of sound colors. He is a founding member of the Milwaukee Laptop Orchestra (MiLO) and he has exhibited his installation work and custom software throughout Milwaukee. He has also collaborated with dance and theater organizations such as the Milwaukee Ballet, Danceworks, and Milwaukee Shakespeare Company, and presented his work in the Spark, BEAF and NIME festivals. Schlei teaches computer music at the UWM Peck School of the Arts where he is the Electro-Acoustic Music Center Technical Director. He also develops software instruments for the iPhone and iPad, including Invisible Drum Set, under the developer name Bit Shape. His latest research into multi-touch instrument technology was presented at the New Interfaces for Musical Expression conference in Sydney, Australia. Download gallery notes for Drams, Whits, Scintillas here. Download gallery notes for the first floor of Lynden here. 7:30 pm: Book release, video screening, and lighting of their outdoor sculpture. Shana McCaw and Brent Budsberg continue to explore scale, illusion, and the dialogue between interior and exterior space in an exhibition that focuses on combustion. The miniature 19th century wooden farmhouse that has been a recurring character in their narrative will make a ghostly, stripped-down appearance on the grounds of the sculpture garden—itself a farm in the 19th century. “Coal-and-ice” is an outline of a foundation dug several inches into the cold, wintry soil. During the opening, the artists will fill the trench with coals and set it alight, leaving a residue of ash in the shape of a house. This remnant will bear an uneasy resemblance to a series of burned or burning, charred and smoke-stained houses—sometimes no more than piles of rubble—captured in large-scale photographs in the gallery. The artists exploit the photographic medium to create the illusion that these are images of real houses, real remains, but subtle clues—scale conflicts, odd or impossible viewpoints, the miniature foundation outside—point to their fictional origin. McCaw and Budsberg have collaborated for a decade on a practice that encompasses sculpture, performance and site-specific installation. Their recent work incorporates models that enable them to consider notions of scale, deception and suspension of disbelief while examining the psychology of place, ancestral memory, and the passage of time. McCaw and Budsberg are also founding members of the WhiteBoxPainters, a performance art group specializing in large-scale, temporary public projects. McCaw currently teaches at the Milwaukee Institute of Art and Design and Cardinal Stritch University. Budsberg is a supervisor at the Steve Lacey 3-D Lab at the Milwaukee Institute of Art and Design. He is also a musician, and has built numerous set pieces for the theatre/film industry. The two received the Mary Nohl Fellowship for Individual Artists in the Established category in 2008. 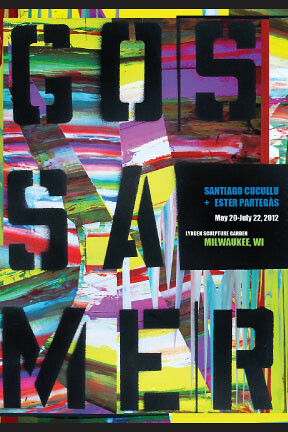 Recent exhibitions include a solo show at the James Watrous Gallery in Madison, Wisconsin; the Nohl Fellows Exhibition at the Institute of Visual Arts (Inova) in Milwaukee, Wisconsin; Descendant, a solo exhibition at the Wright Museum of Art in Beloit, Wisconsin; and Current Tendencies: Ten Artists from Wisconsin at the Haggerty Museum of Art in Milwaukee. In May 2011, McCaw and Budsberg will be in residence in Wendover, Utah with the Los Angeles-based Center for Land Use Interpretation. As a collector, Peg Bradley embraced Pop Art, particularly the prints of Andy Warhol, Roy Lichtenstein and James Rosenquist. A selection of Pop works on paper will be on view in the gallery, and many new works will be on display on the first floor of the house. Some—a large painting by Peter Max, silkscreens by Biasi & Landi and small sculptures by Vasa—shed light on the Pop era; others—a charming Milton Avery drawing of croquet players, a beach scene by American Impressionist Edward Henry Potthast—demonstrate Peg Bradley’s affection for bright yet intimate works. View Frank Juarez's interview with the artists for EFFJAY PROJEKTS. Eddee Daniel has been observing and photographing construction fences in the landscape for several years, attracted by their obtrusive orange color and the questions they raise about function, aesthetics—particularly in natural areas—and access. When he exhibited these photographs in 2009, Daniel created a more immediate experience for the viewer by simultaneously installing construction fences inside and outside the gallery space. At Lynden, Daniel continues to explore the fences’ ambiguous functionality, this time amidst the natural landscaping and permanent artworks of the sculpture garden. His collaborator, Philip Krejcarek, is constructing sculptures that evoke ladders. Unlike the fences, these ladder-like forms are defiantly non-functional. Daniel’s and Krejcarek’s project ranges from the surreal to the whimsical as it explores the relationship between creating and constructing and plays with the very notion of collaborative sculpture. In the gallery, Daniel presents selections from his Accidental Art series—photographs depicting fences erected by construction contractors in natural areas—and Krejcarek continues to subvert the functional with a series of small sculptures from his Architectural Structures series. 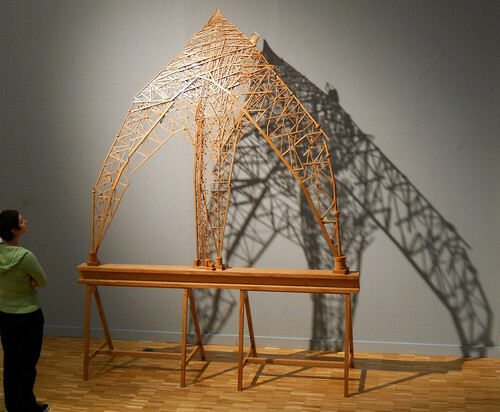 In these works, Krejcarek combines the non-utilitarian quality of sculpture with the practical concepts of architecture. Krejcarek was addressing sociological issues—“cities, houses, and relationships”—when he made the work in 1999, and the particular examples on view here challenge our expectations of interior and exterior, inside and outside, in the realms of architecture and human relations. Philip Krejcarek is a professor of art and chair of the Department of Visual and Performing Arts at Carroll University where he teaches photography. He has been a professor at Carroll since 1977. He is the author of An Introduction to Digital Imaging and Digital Photography: A Hands-On Introduction, both published by Cengage Learning. He is a recipient of a Wisconsin Arts Board grant and his work is included in the collections of the Milwaukee Art Museum, the Haggerty Museum of Art, the Wustum Museum of Fine Arts, and the Denver Art Museum. His sculpture and photographs are also included in the Waukesha Public Library collection. Krejcarek’s work has been purchased through the Wisconsin Arts Board Percent for Art Direct Purchase Program for public buildings.